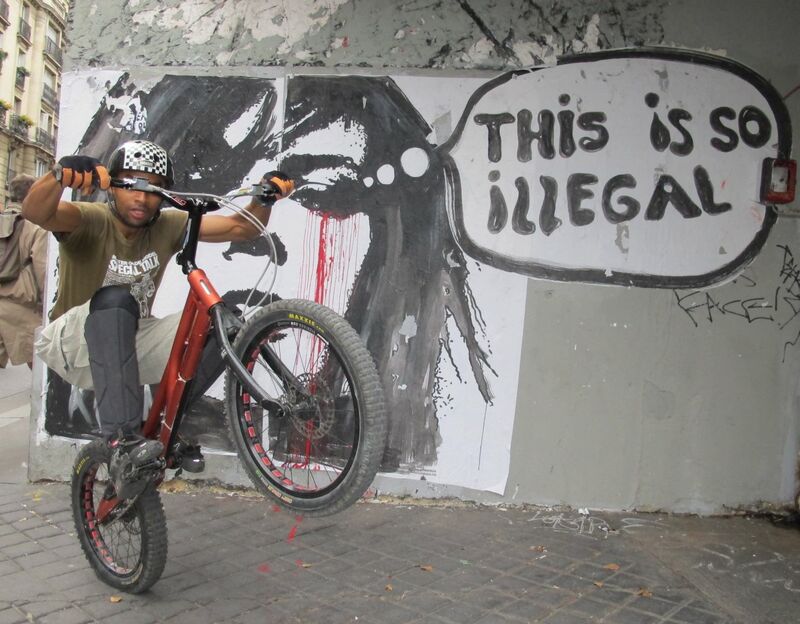 Here are the riders you'll illustrating the TrashZen tutorials. 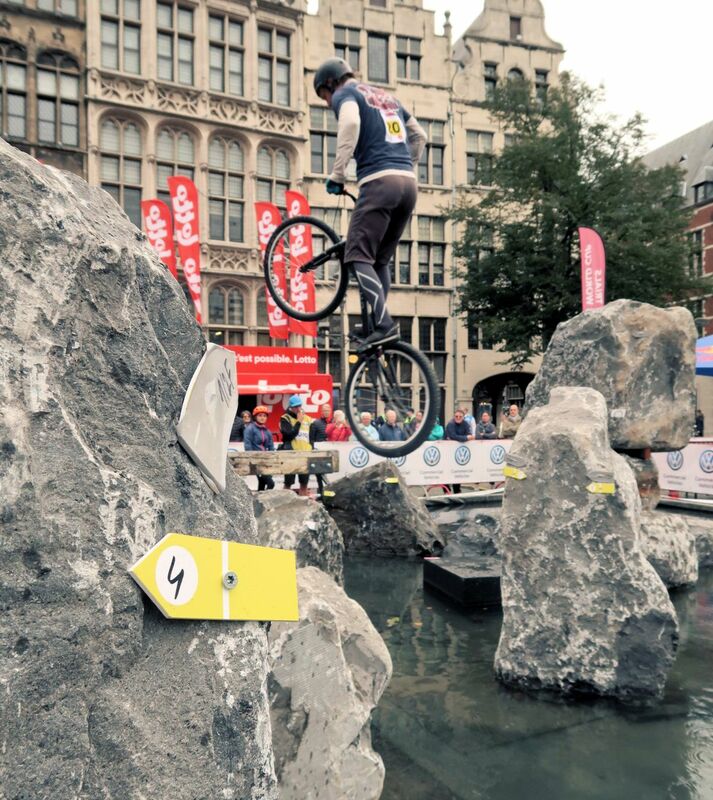 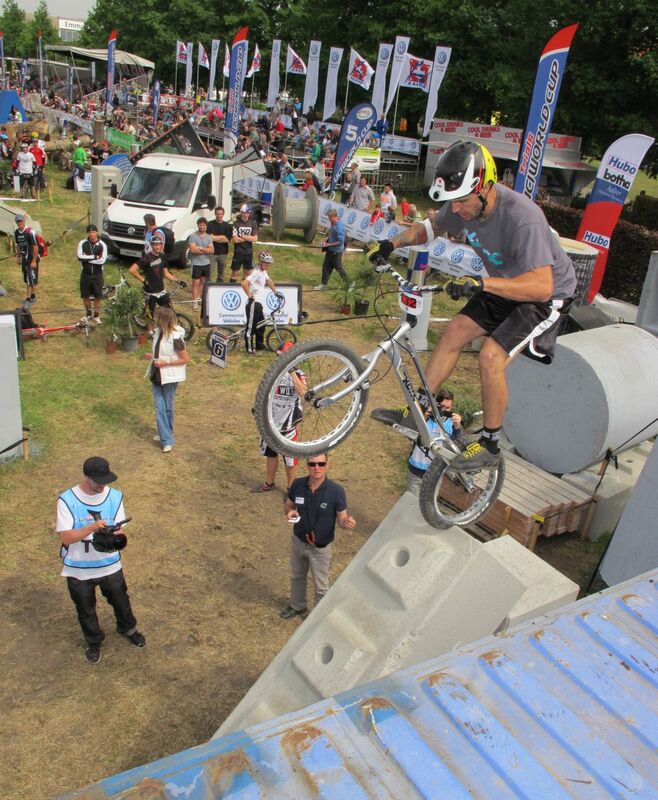 Some are professionals and regularly compete at international events, some are local riders who just shared their tips or impressions, all have a passion for trials riding. 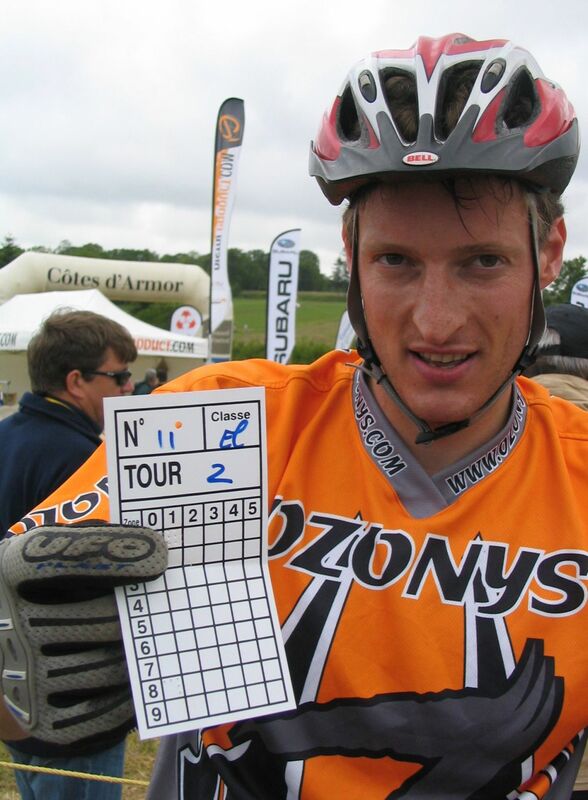 Abel Mustieles has won it all in the 20-inch category and is looking at leaving a trace in the 26-inch category too. 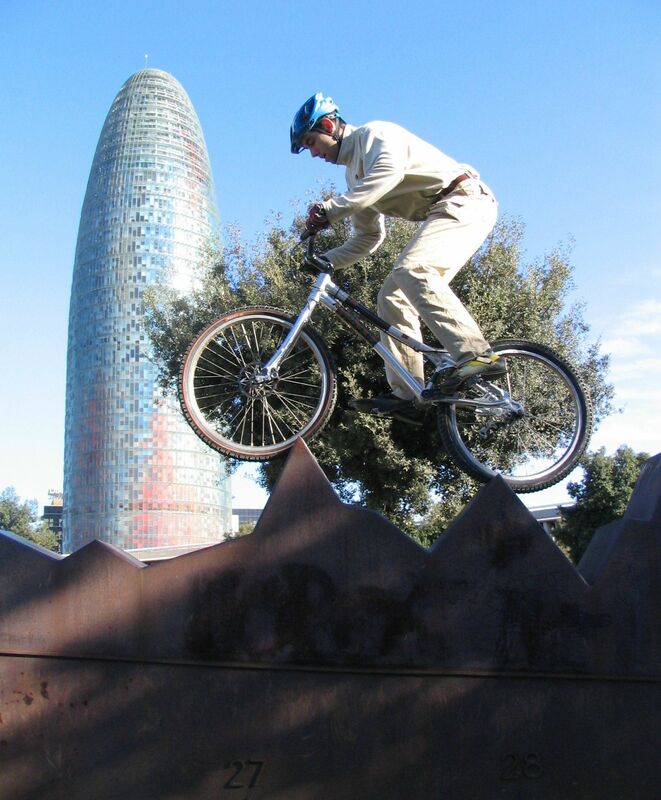 He is Benito's closest rival. 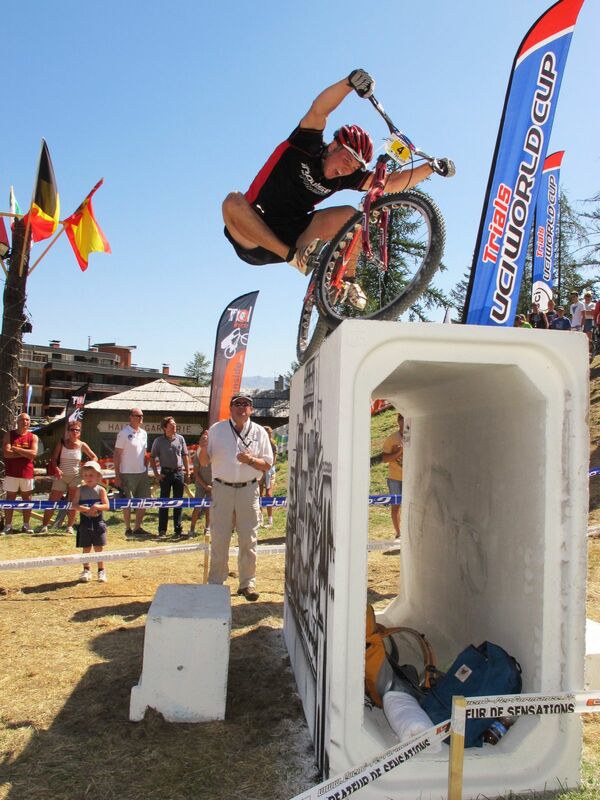 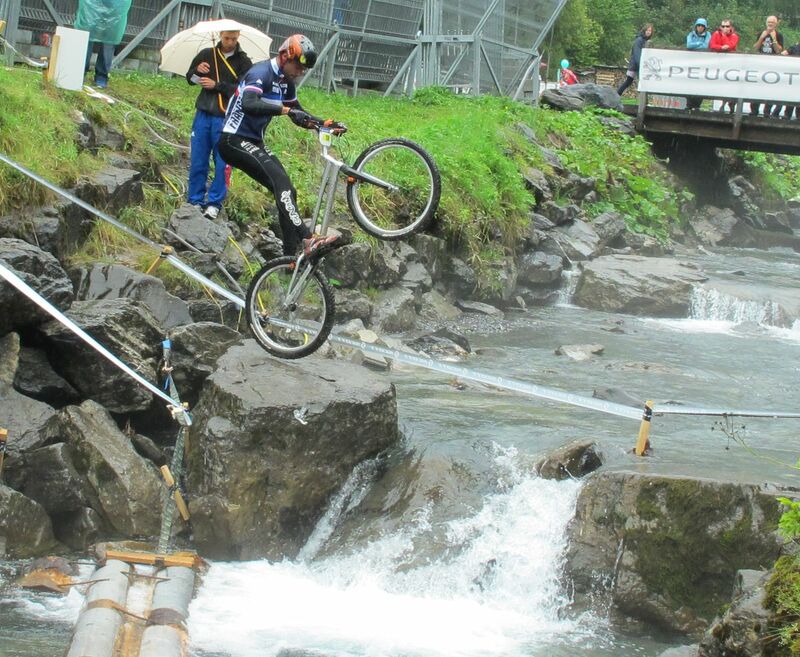 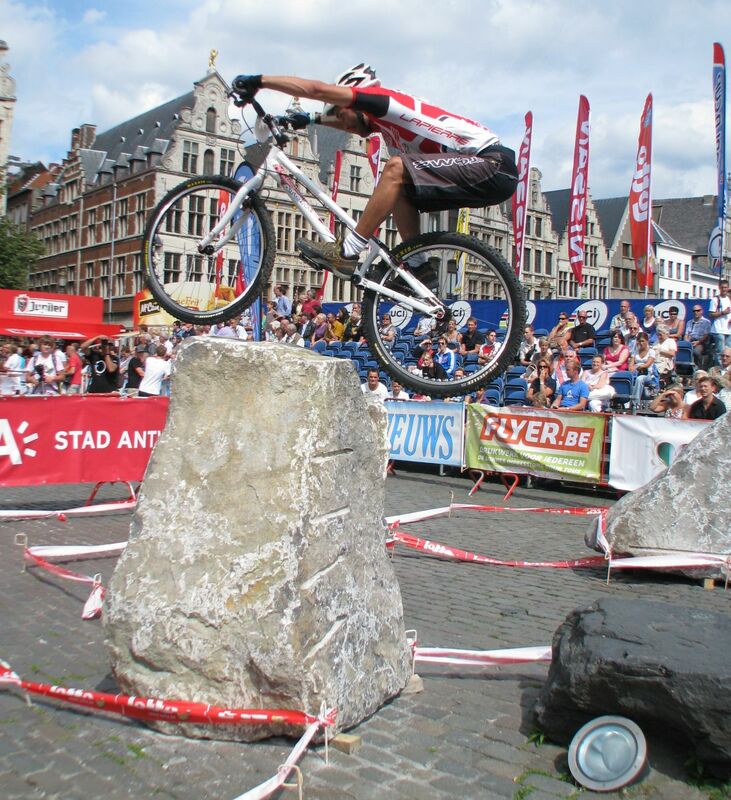 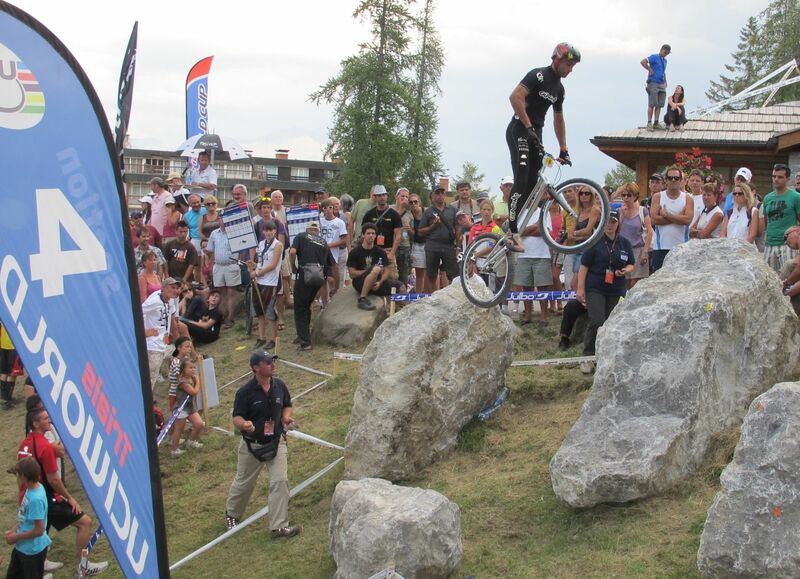 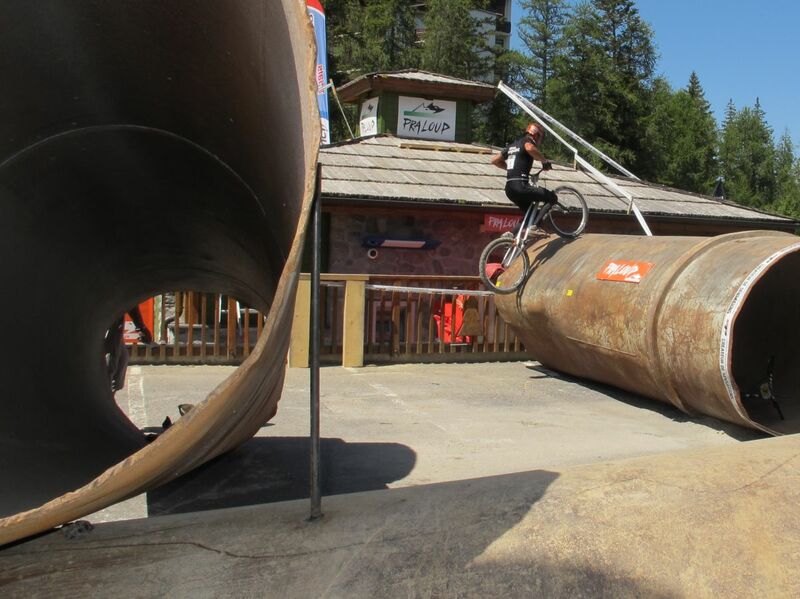 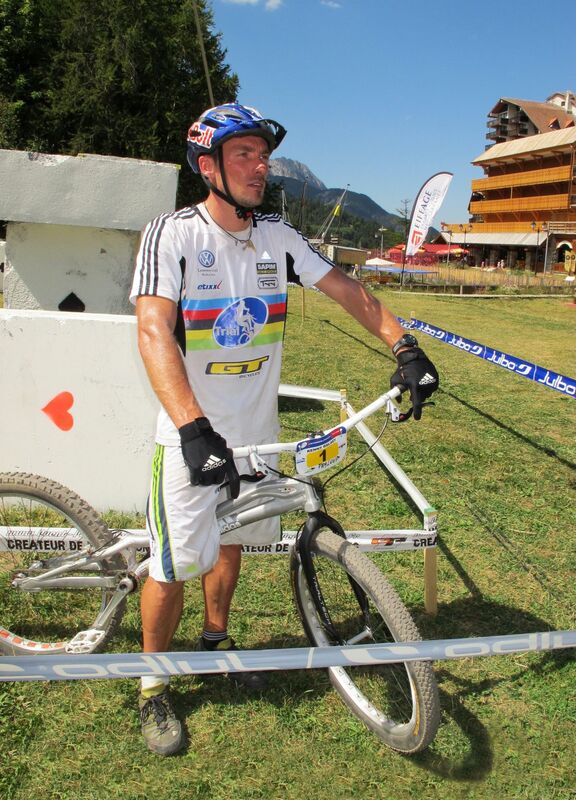 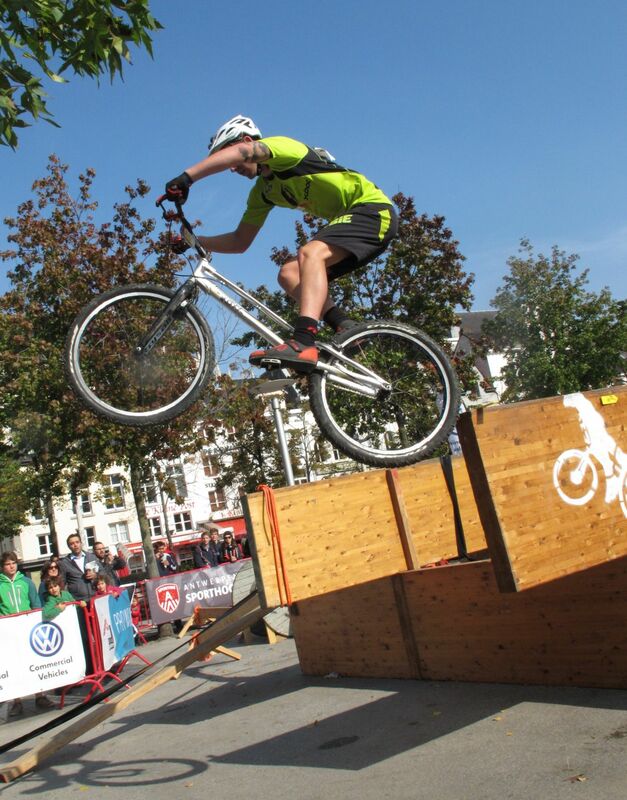 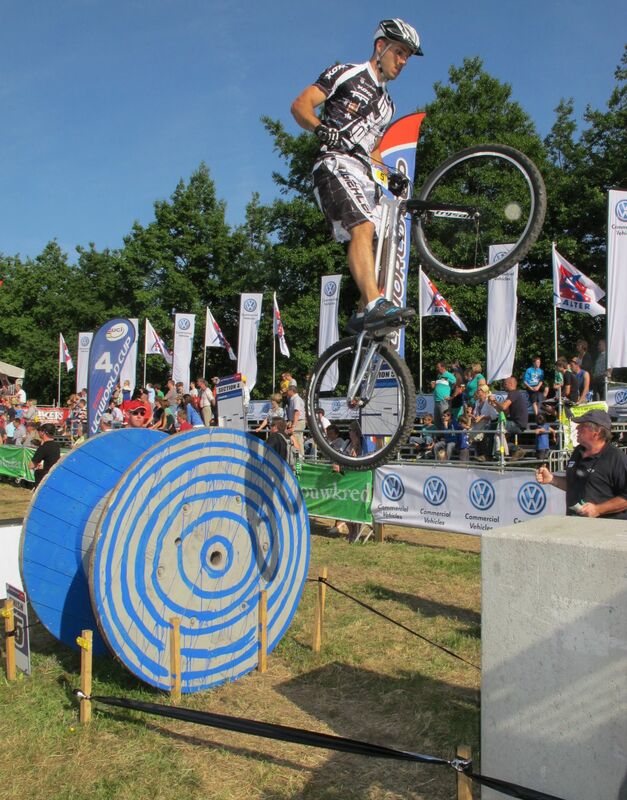 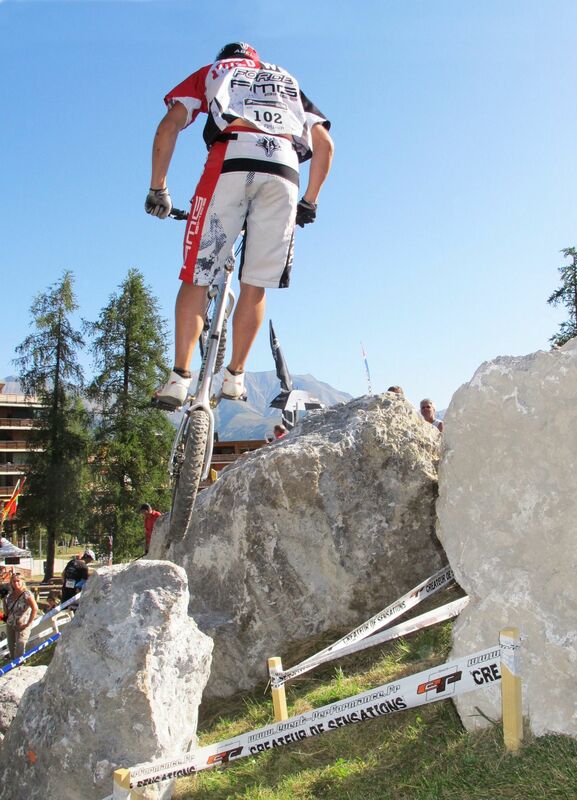 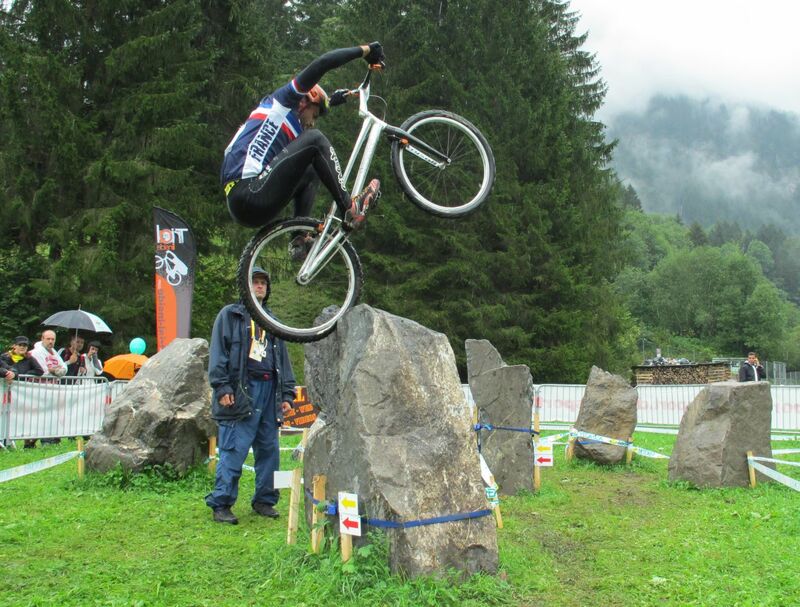 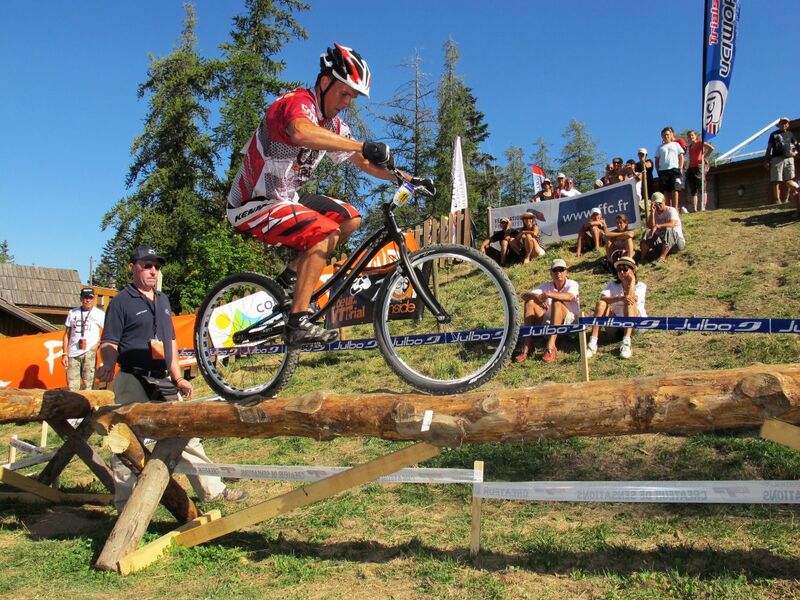 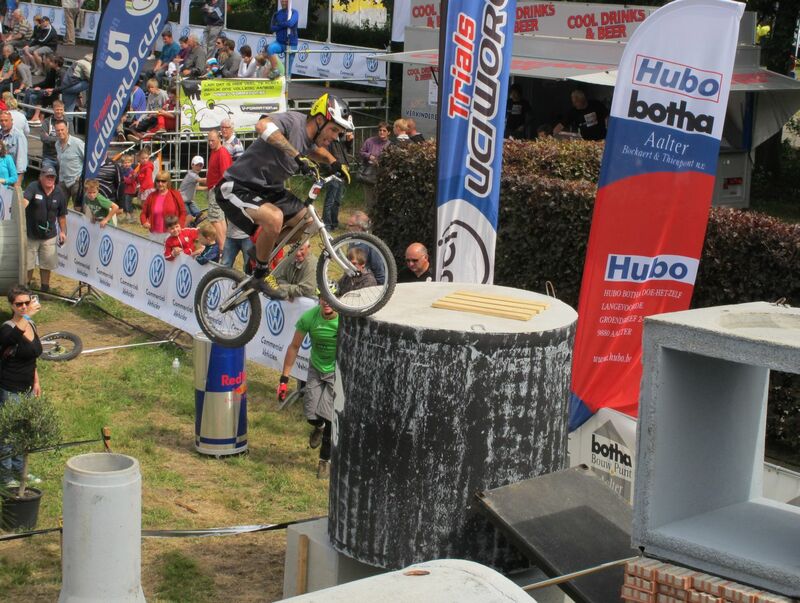 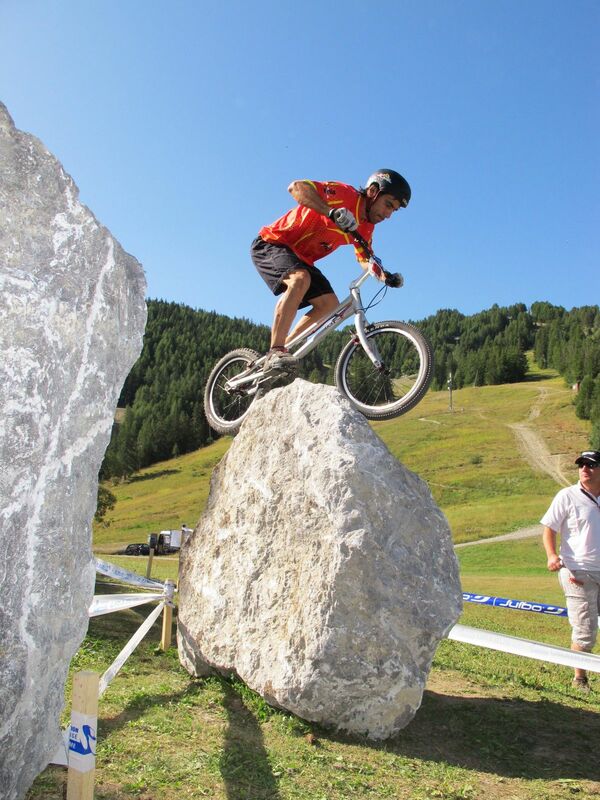 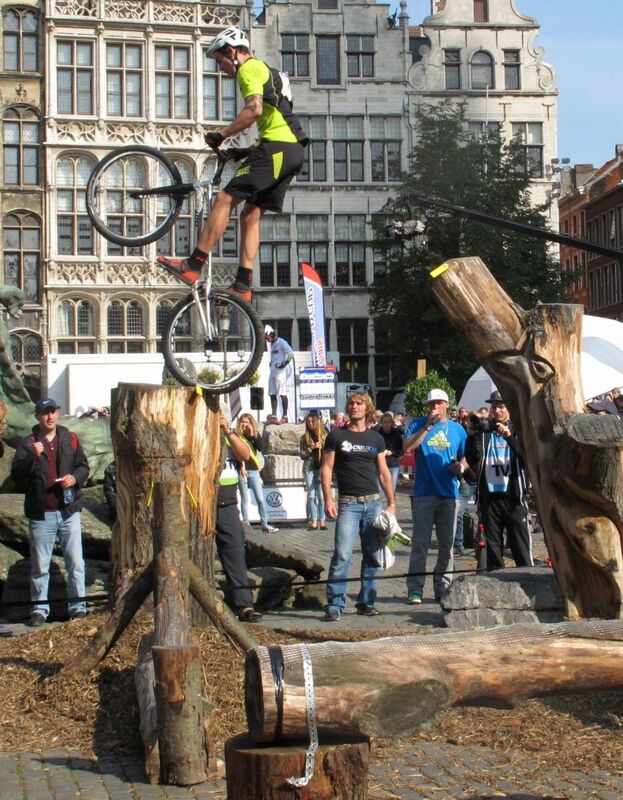 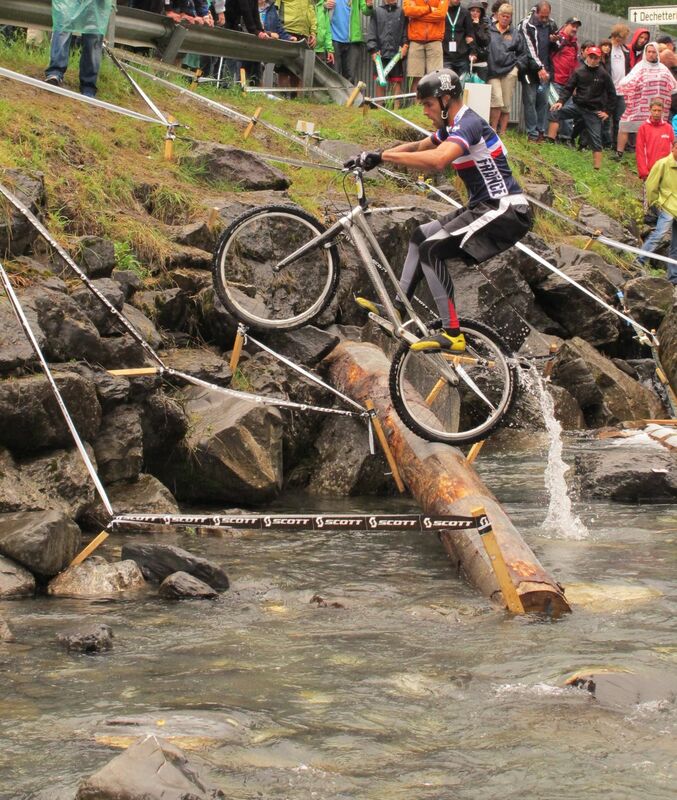 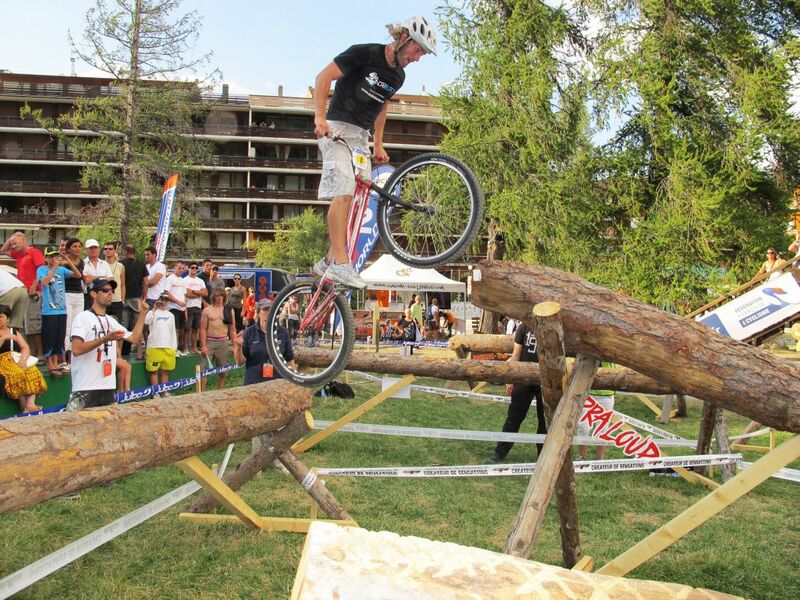 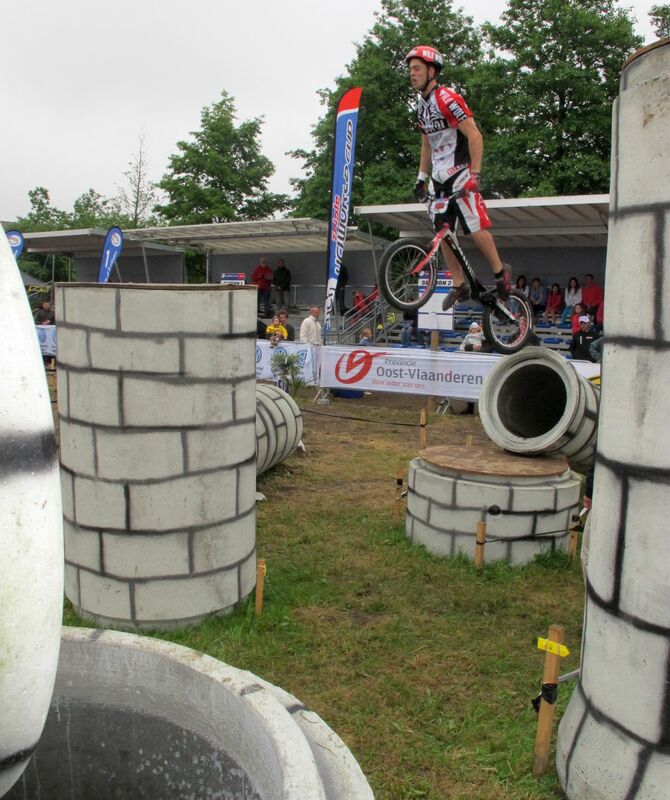 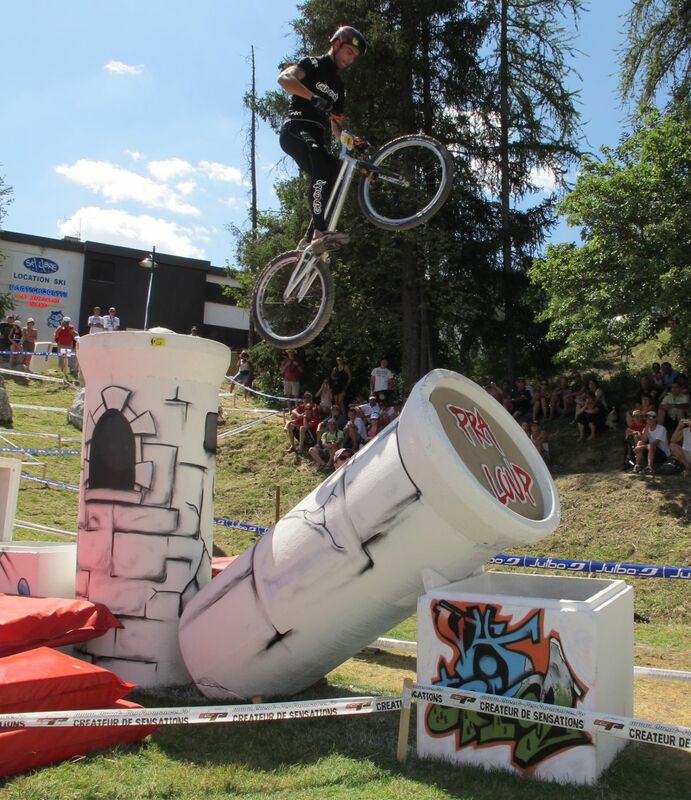 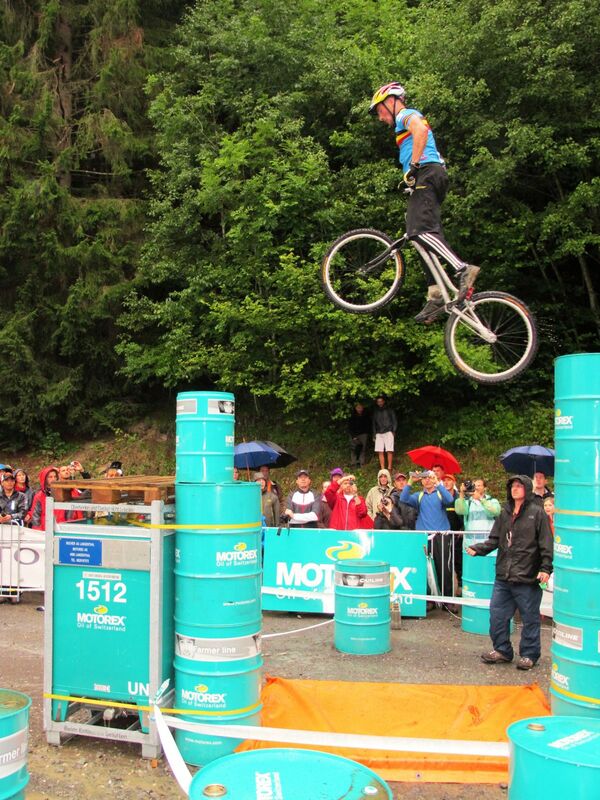 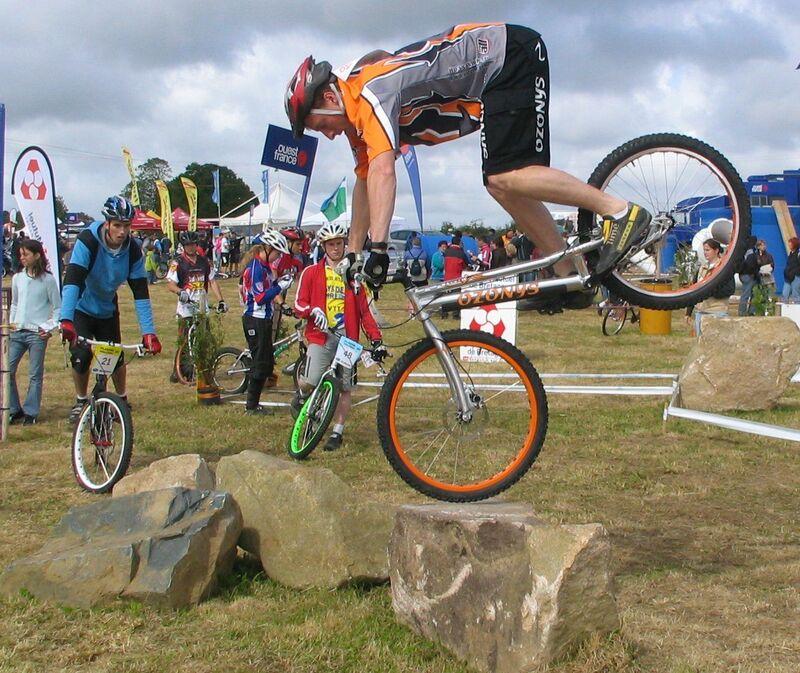 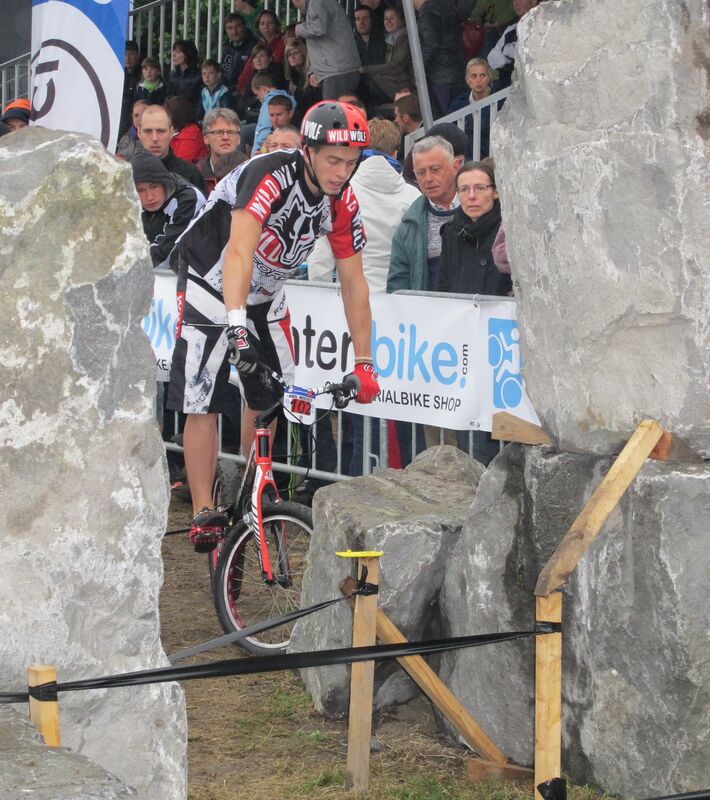 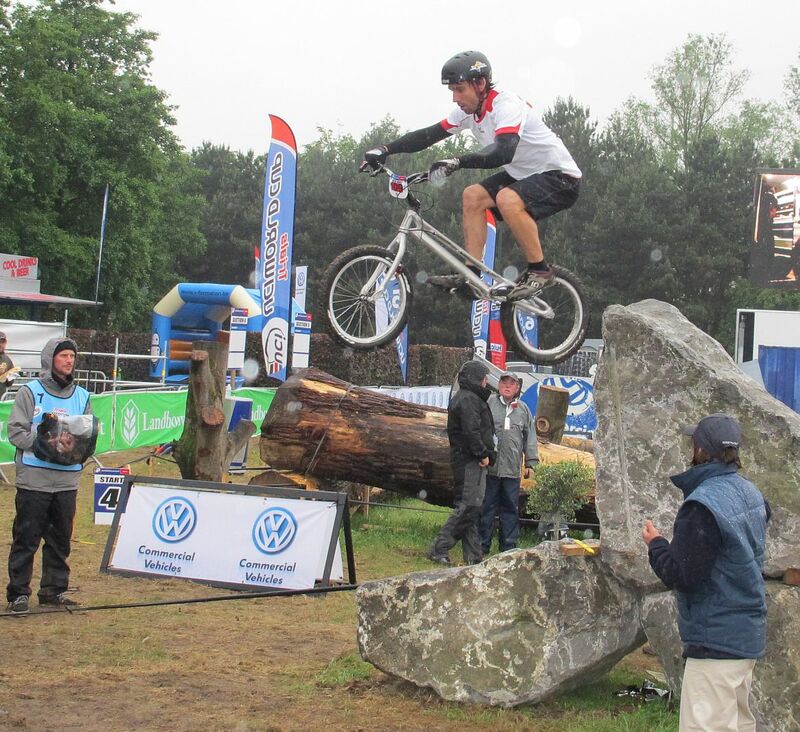 A top notch British rider, Andrei Burton maintains himself in the top ten riders worlwide at UCI competitions. 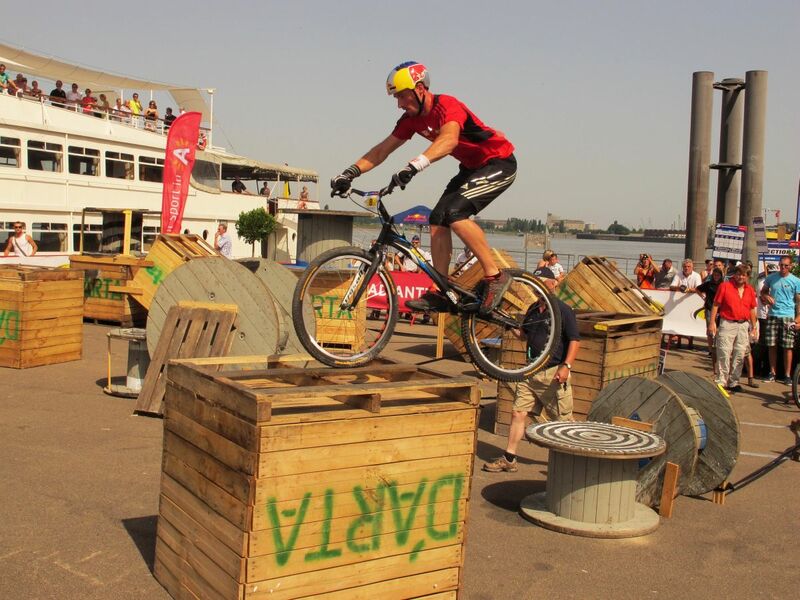 He also runs demos and biking events for a living. 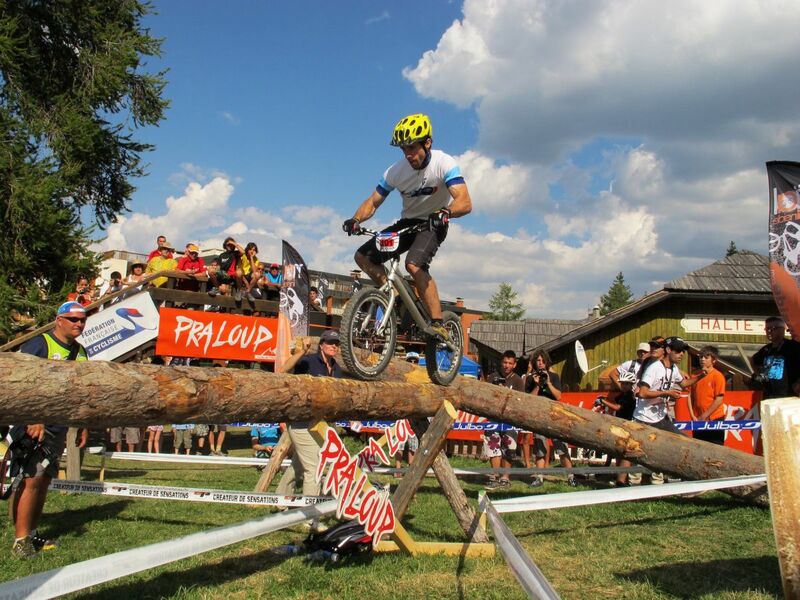 French rider Aurélien Fontenoy is equally at ease in the 20-inch and the 26-inch categories, regularly in the top ten riders worldwide. 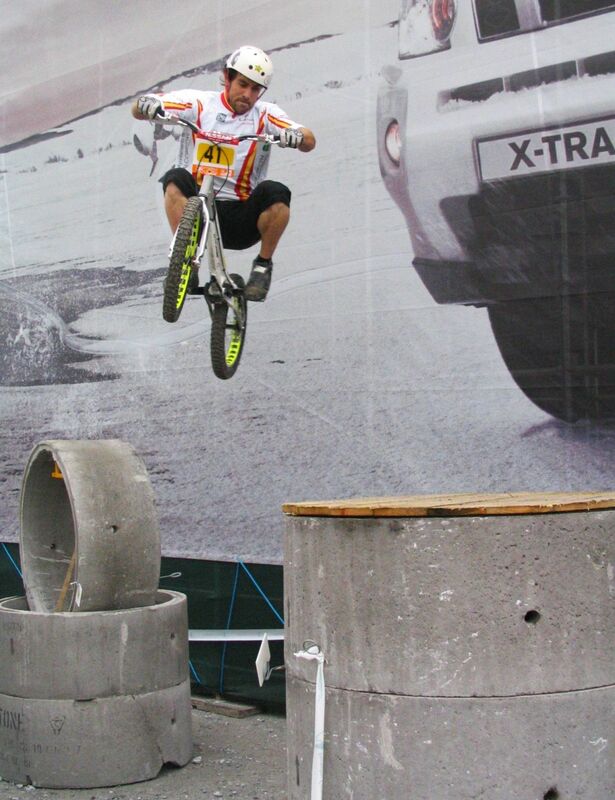 Reaching a legend status, top spanish rider Benito Ros has won numerous world champion titles in the 20-inch category. 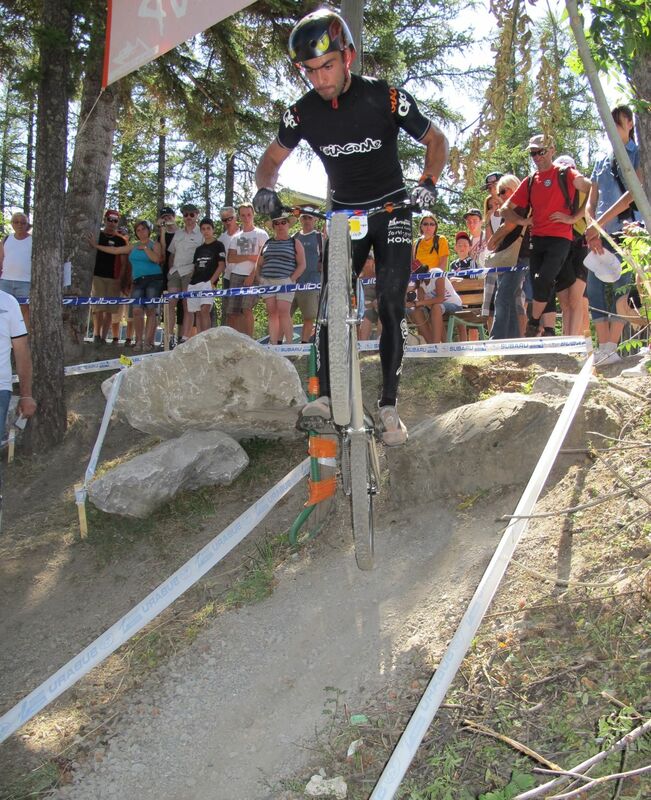 Bruno Arnold is a former French champion in the 26-inch category. 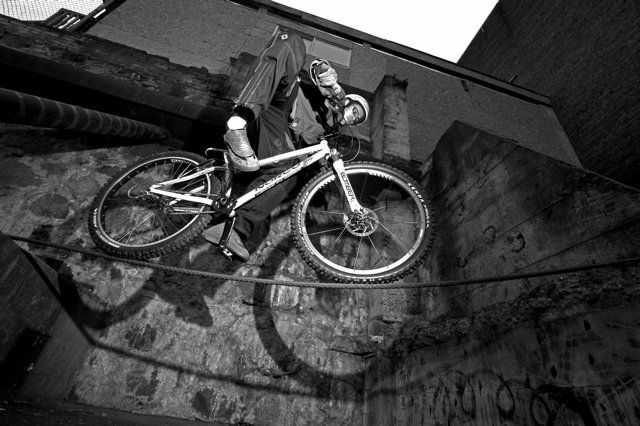 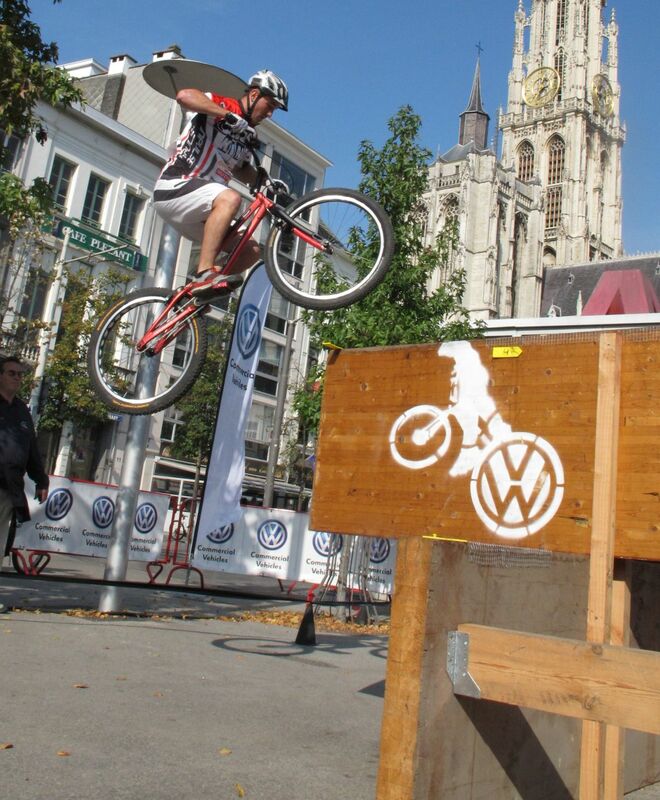 He launched and runs the Ozonys and the Bonz bikes trials brand. 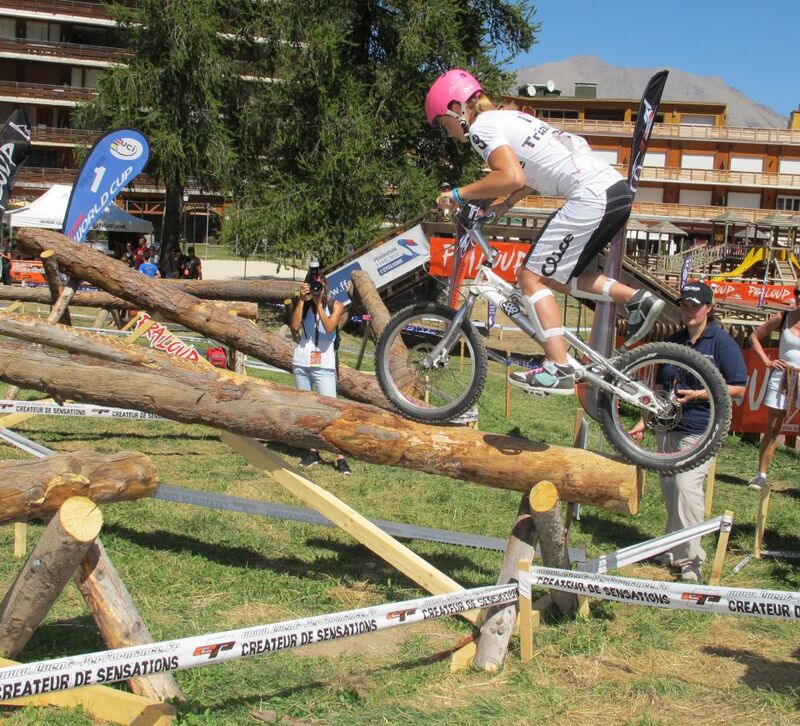 Carlez Diaz Codina is another top spanish rider in the mod category, he has been on the professional circuit for many year, often in the top 5 at UCI competition. 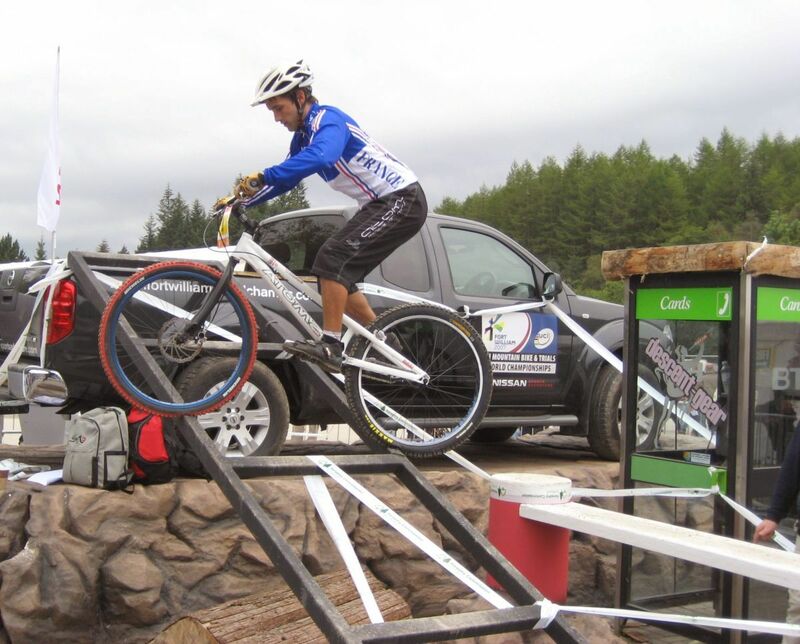 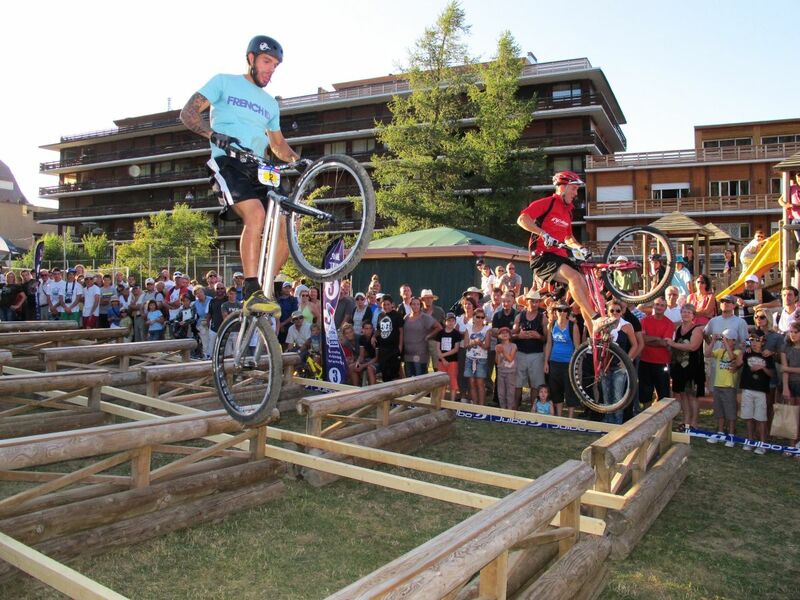 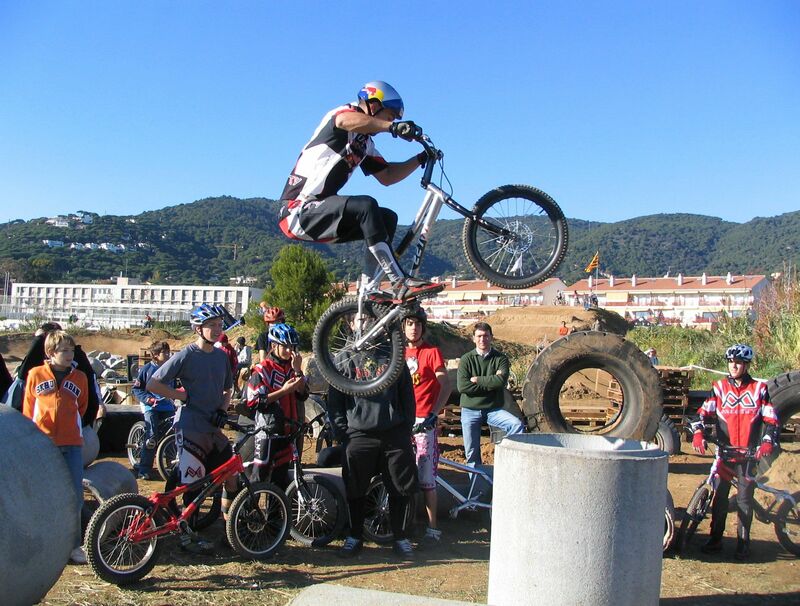 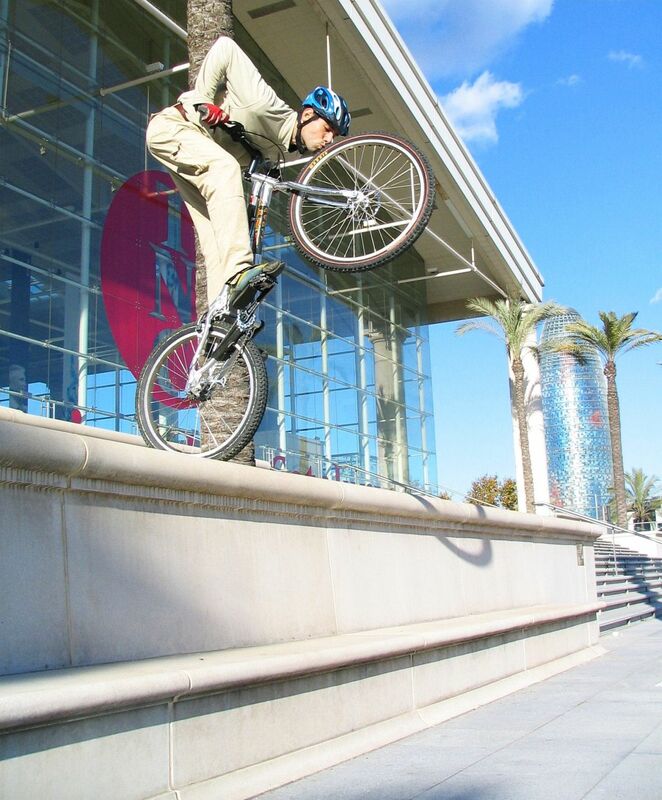 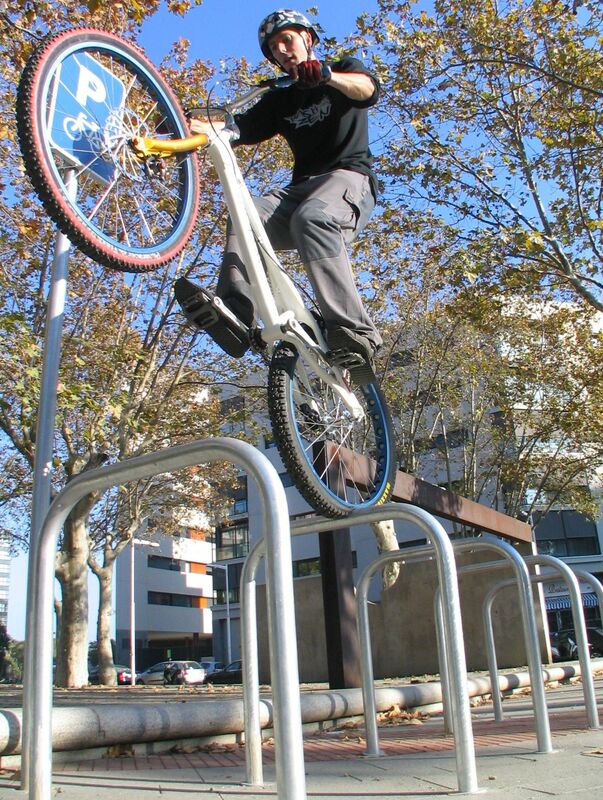 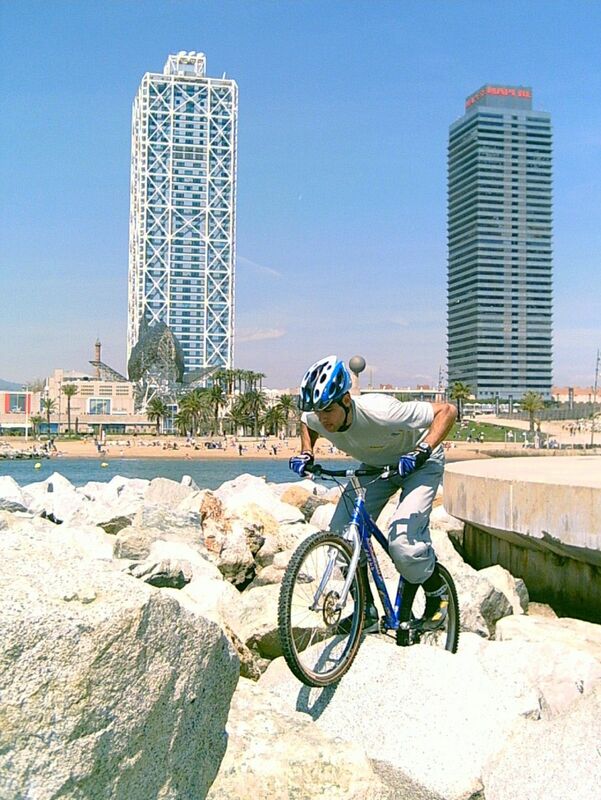 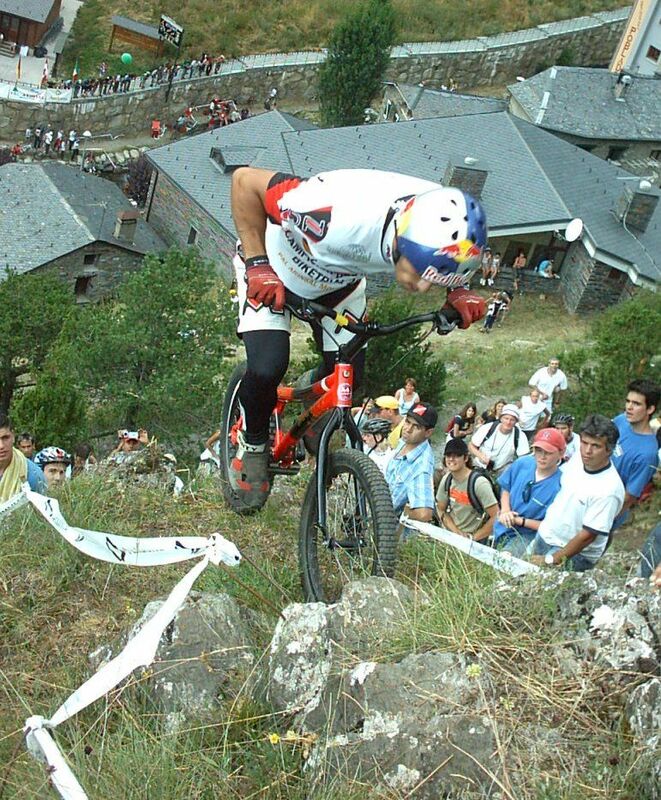 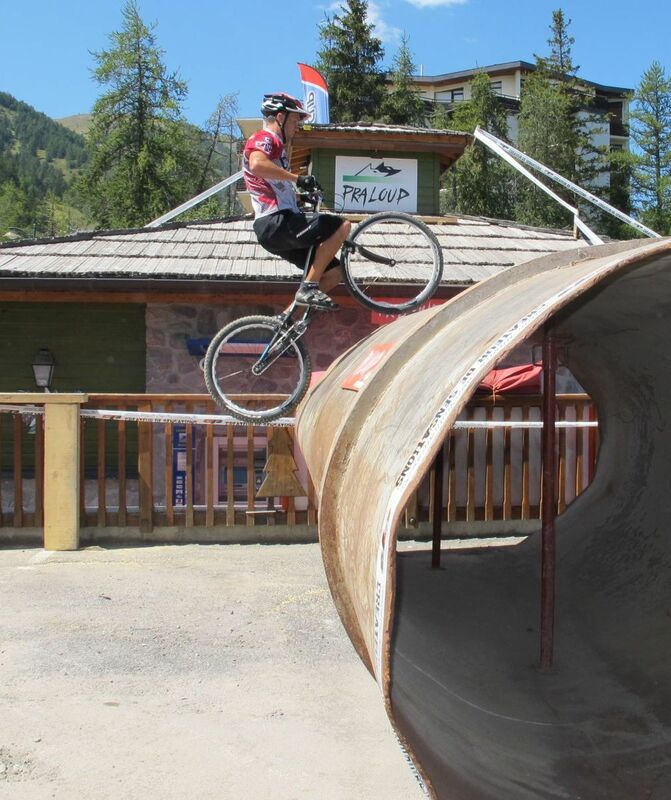 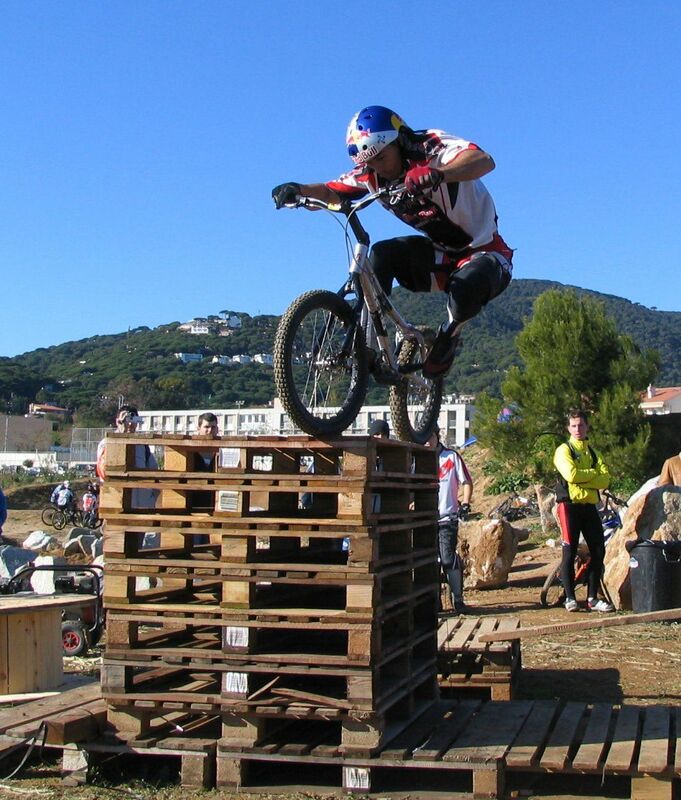 11 times World Biketrial champion, Cesar Cañas now runs the César Cañas Trial Academy at the 'La Poma' Bikepark, in Premià de Dalt near Barcelona. 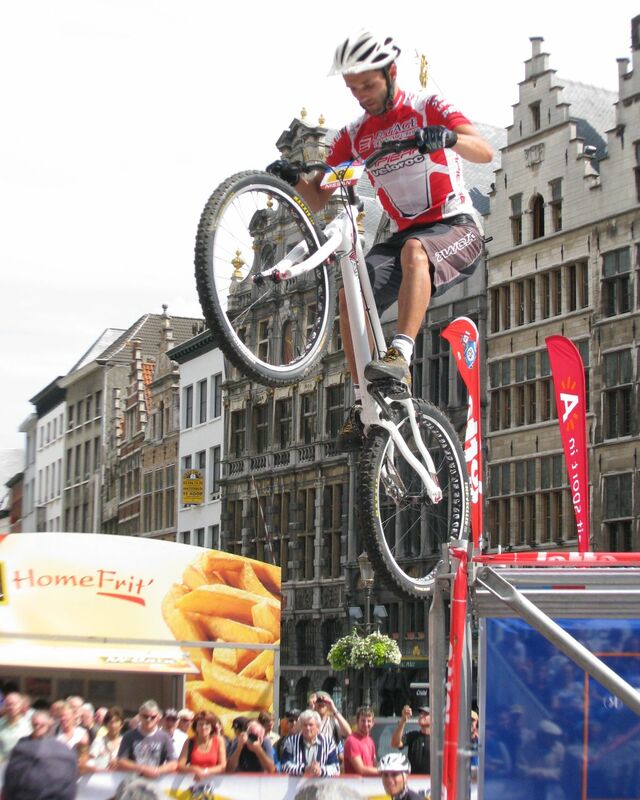 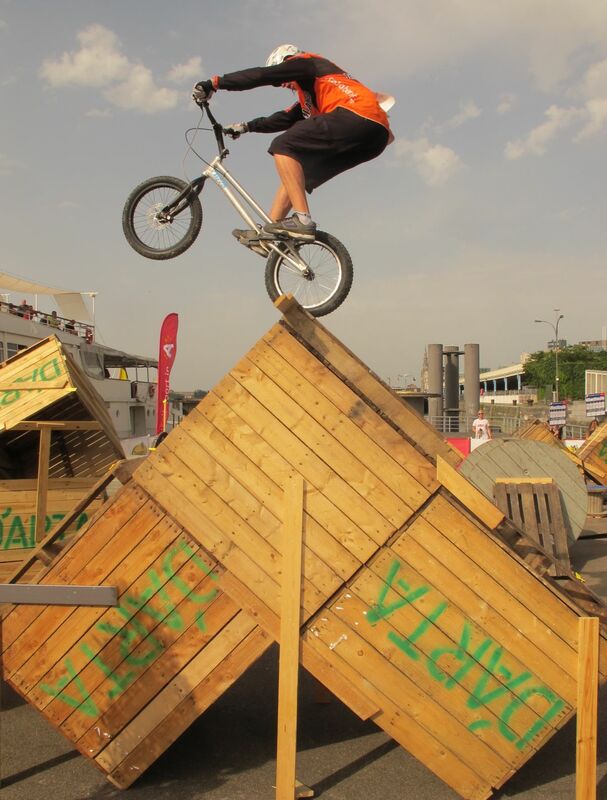 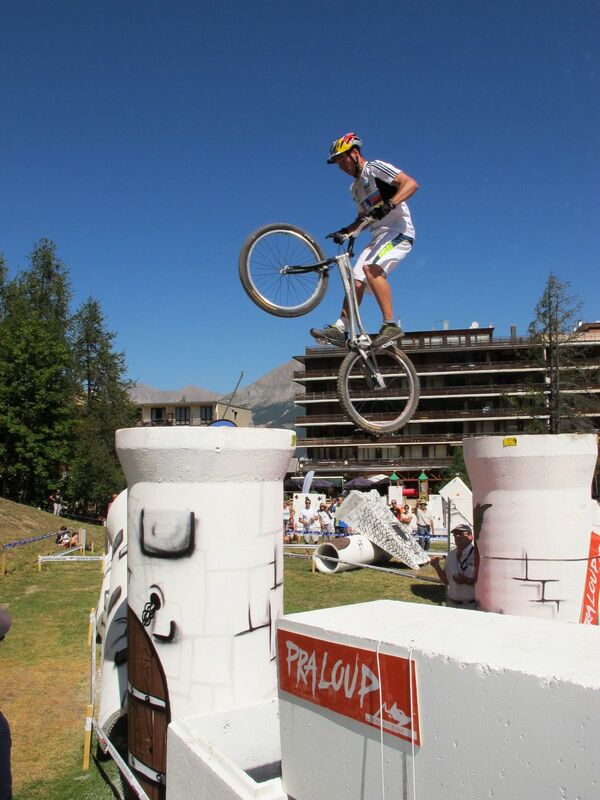 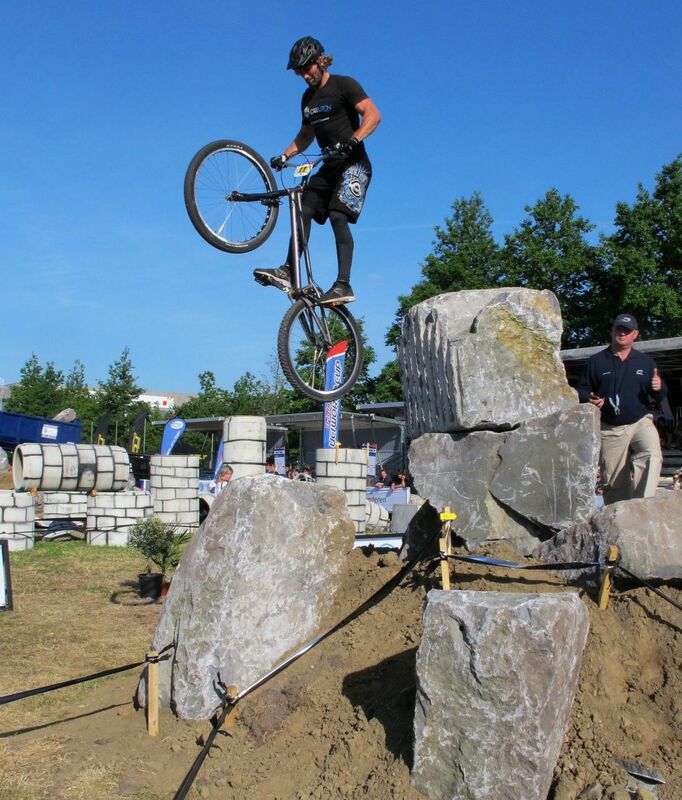 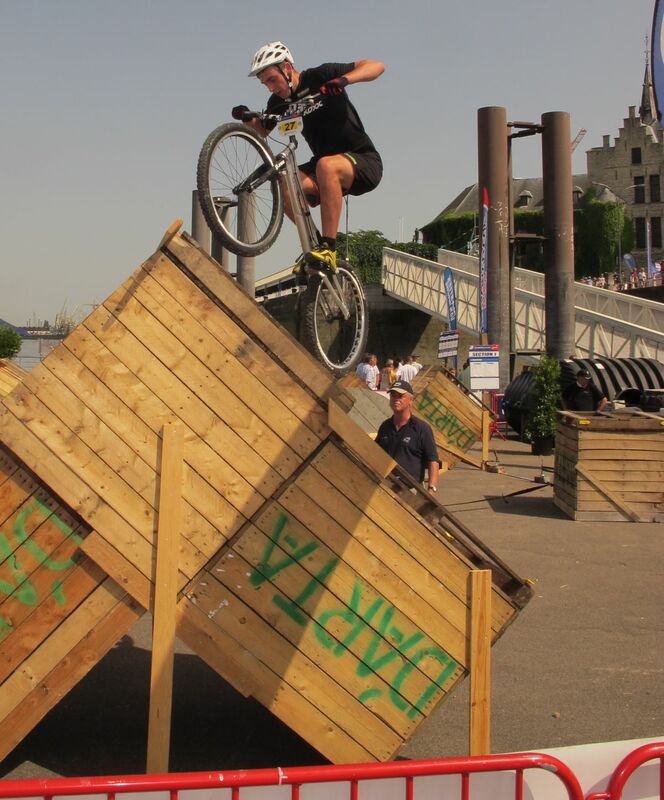 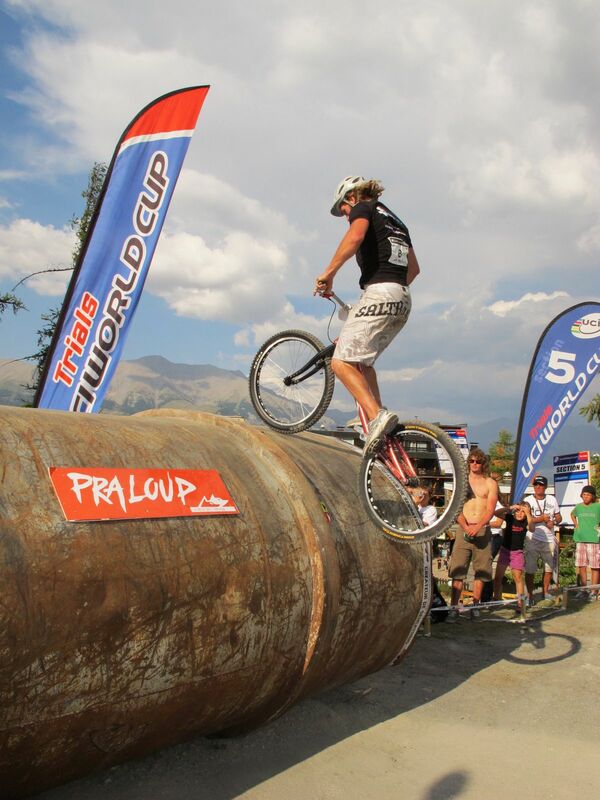 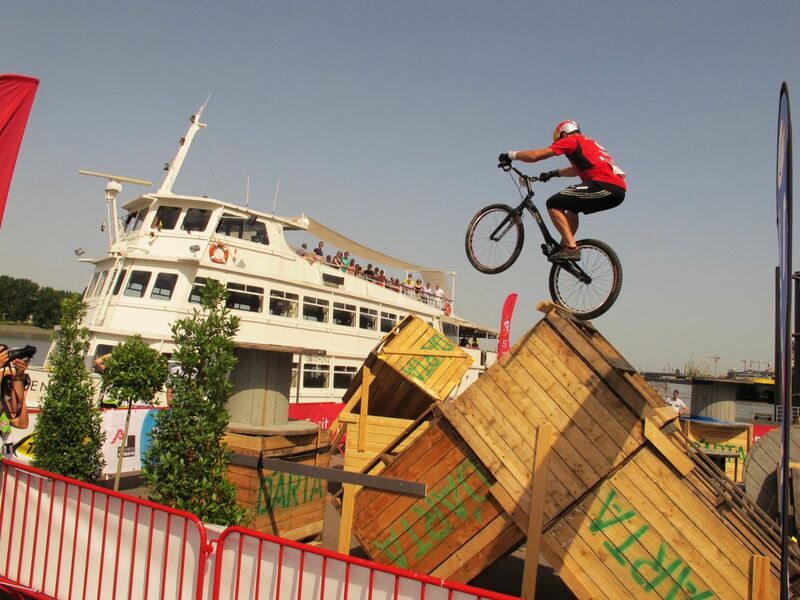 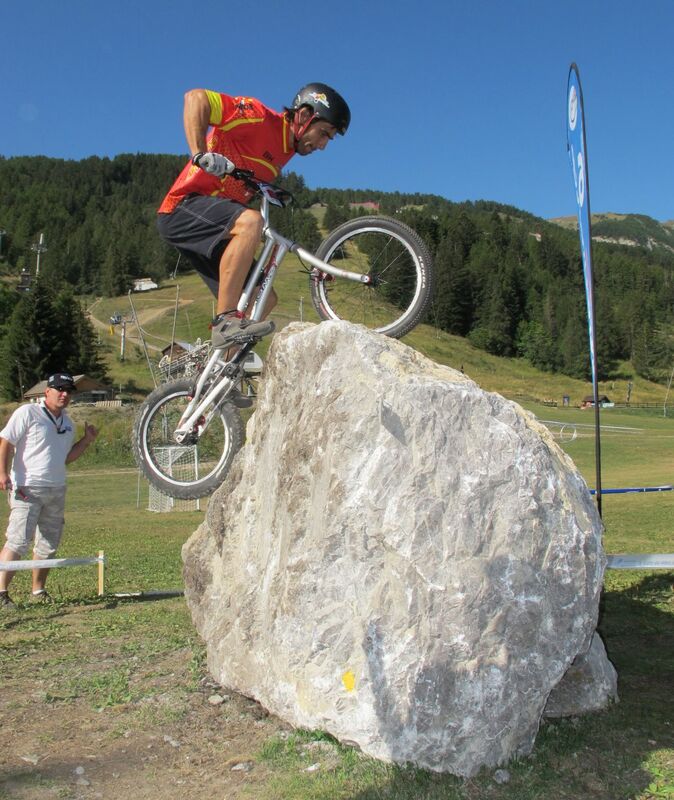 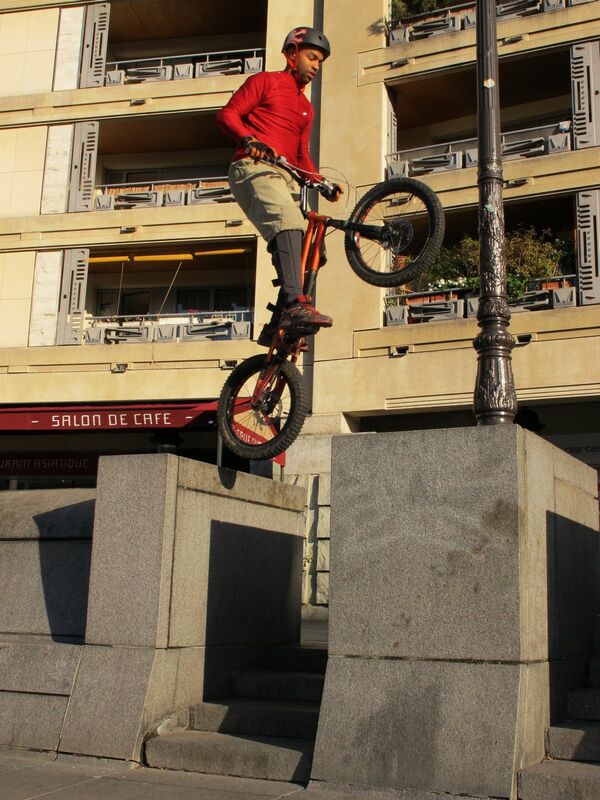 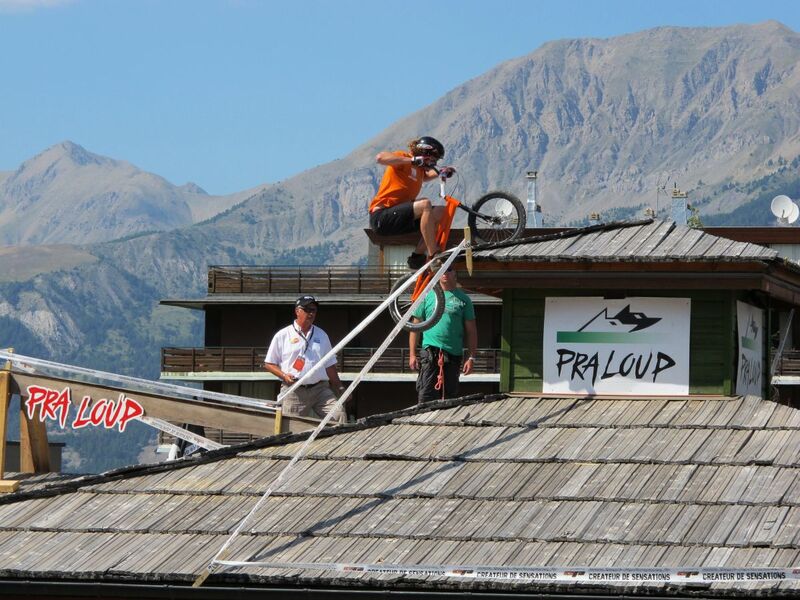 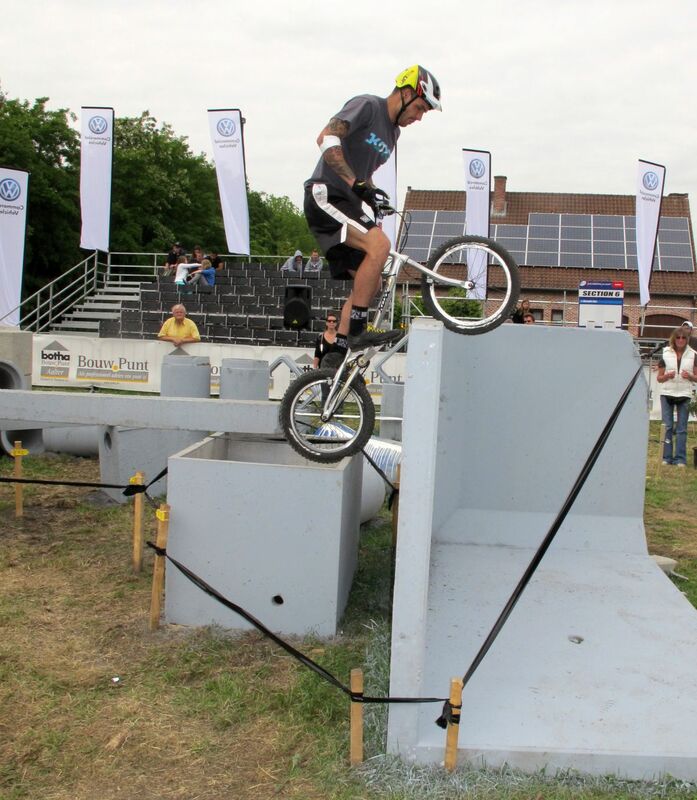 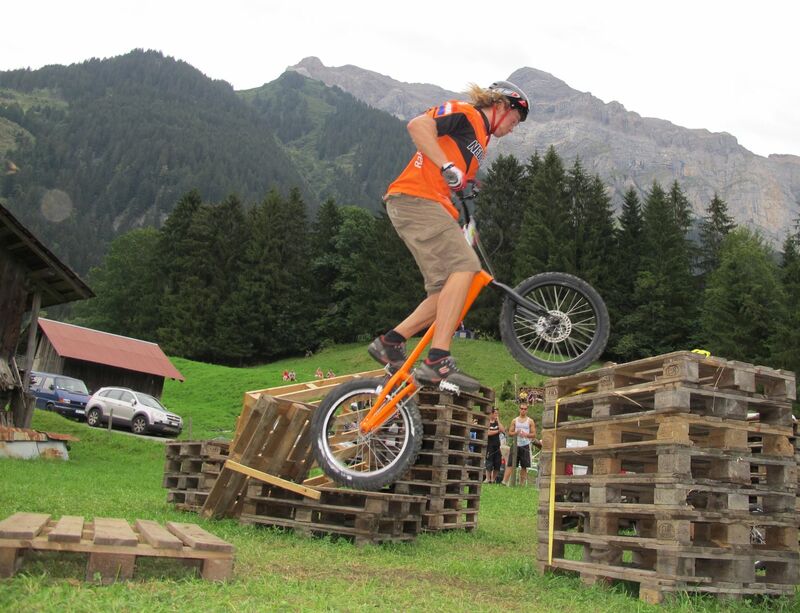 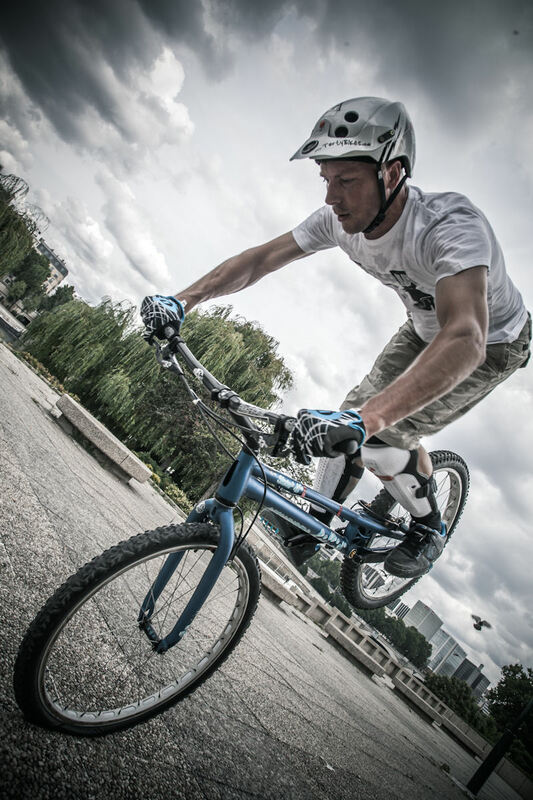 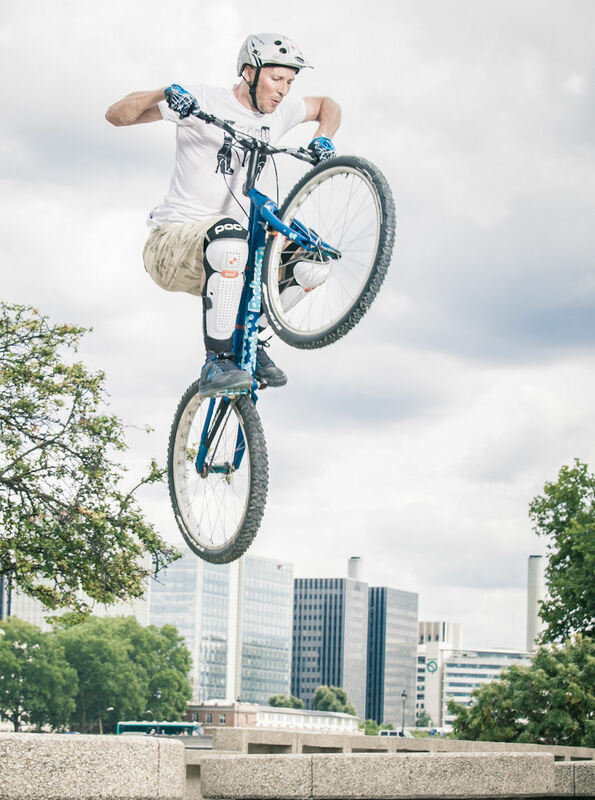 Giacomo Coustellier is a professional trials rider since 2002 and actually rides trials since the age of 6. 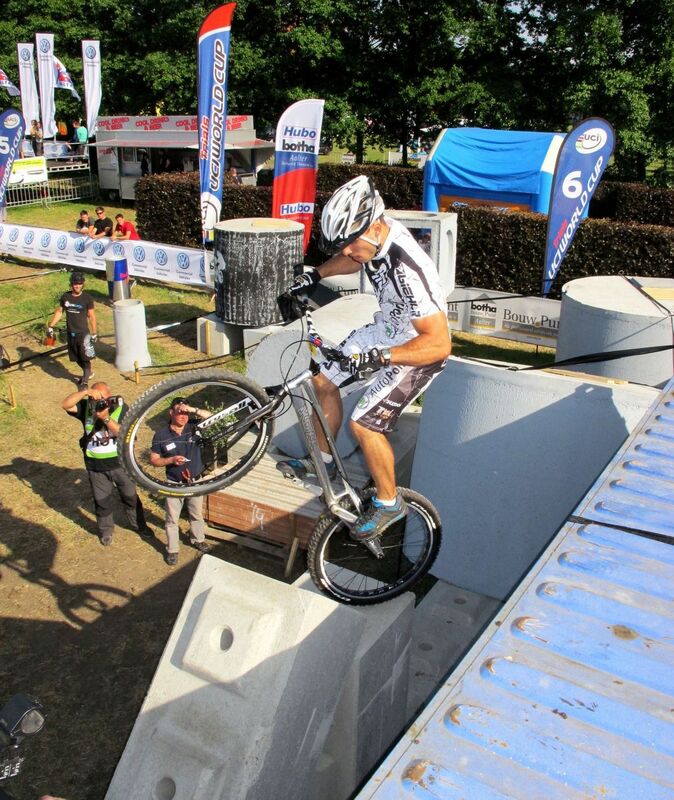 He has been 3 times world champion and holds many national champion titles. 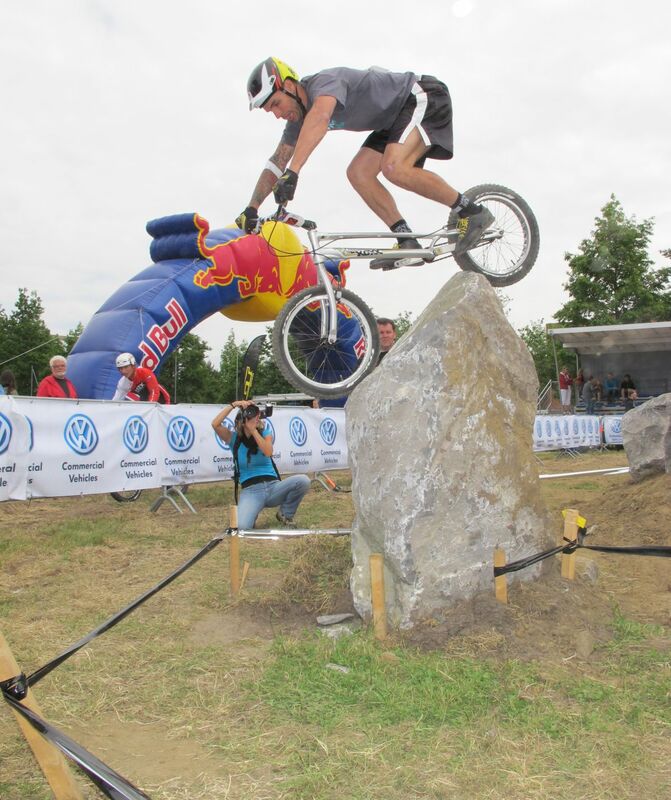 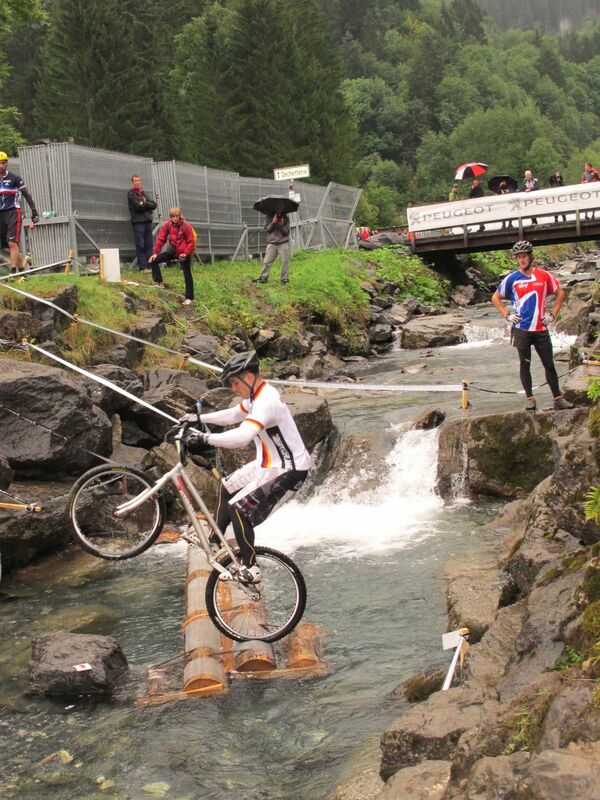 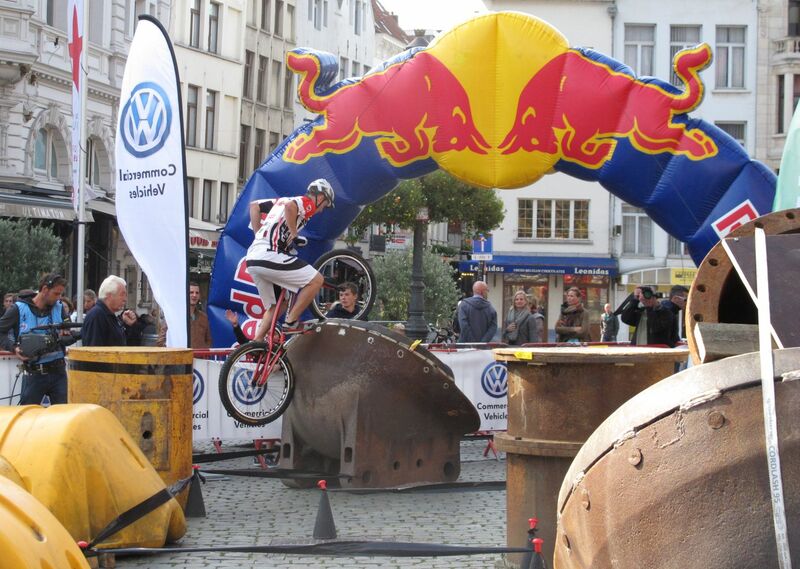 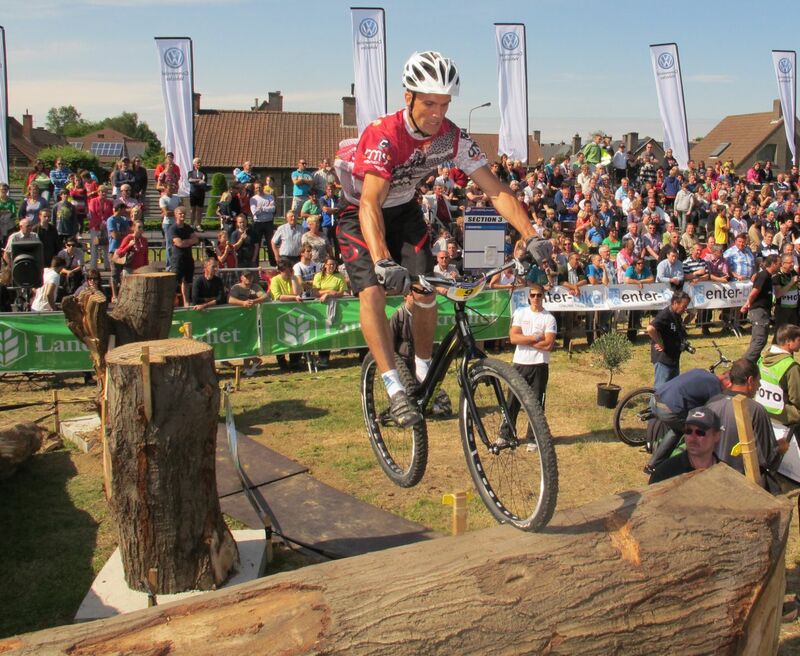 Germany's national champion Hannes Herrmann is regularly in the top ten at UCI's world cups. 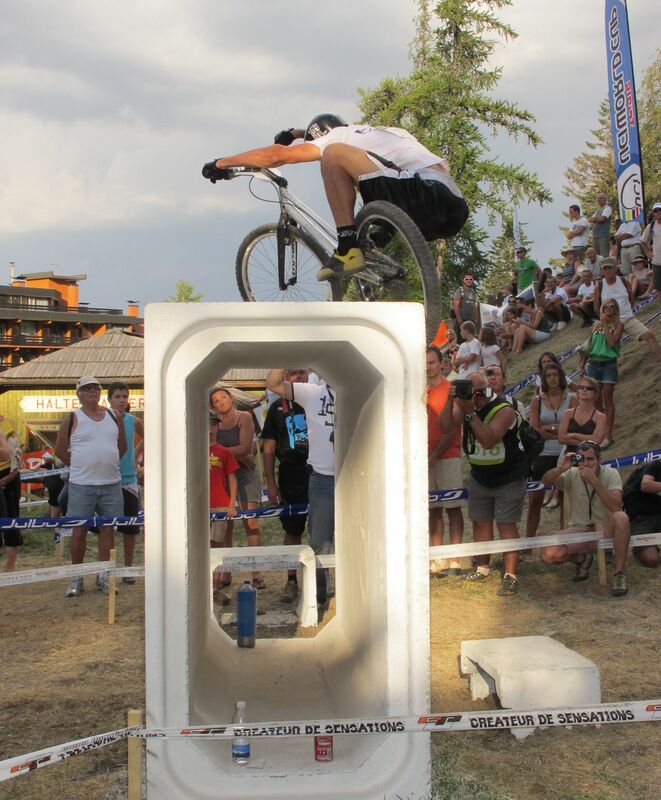 He is definitely among the next generation of riders to aspire at the ultimate podium. 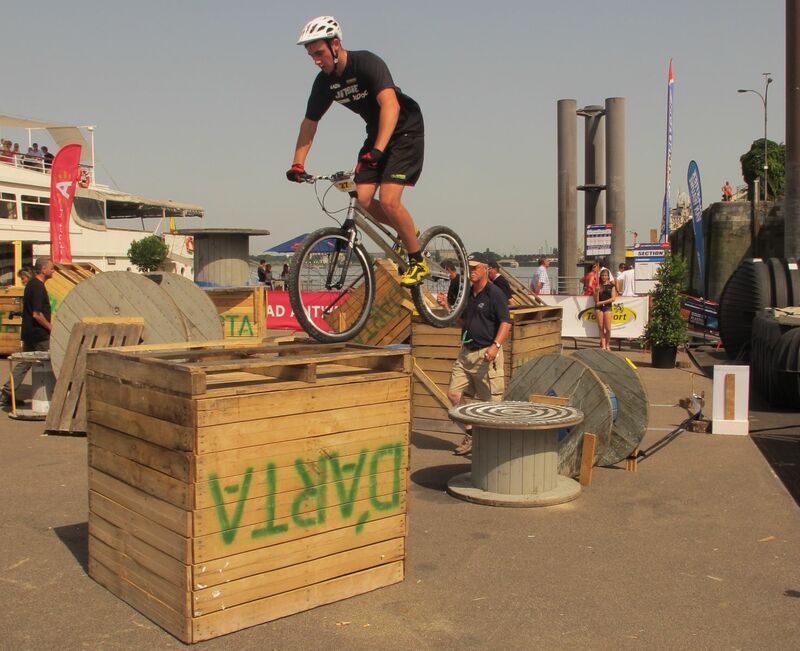 British sensation Jack Carthy has an enormous winning appetite and has been rivalising with the best elite riders very early in his carrier. 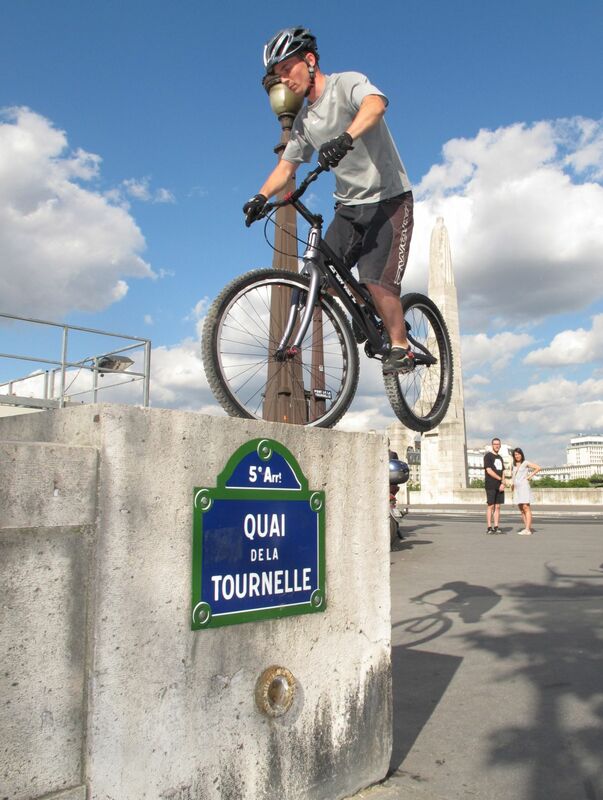 Another rider from the Parisian trials scene, Janos Boudet can talk endlessly about very fine technical details before demoing the moves. 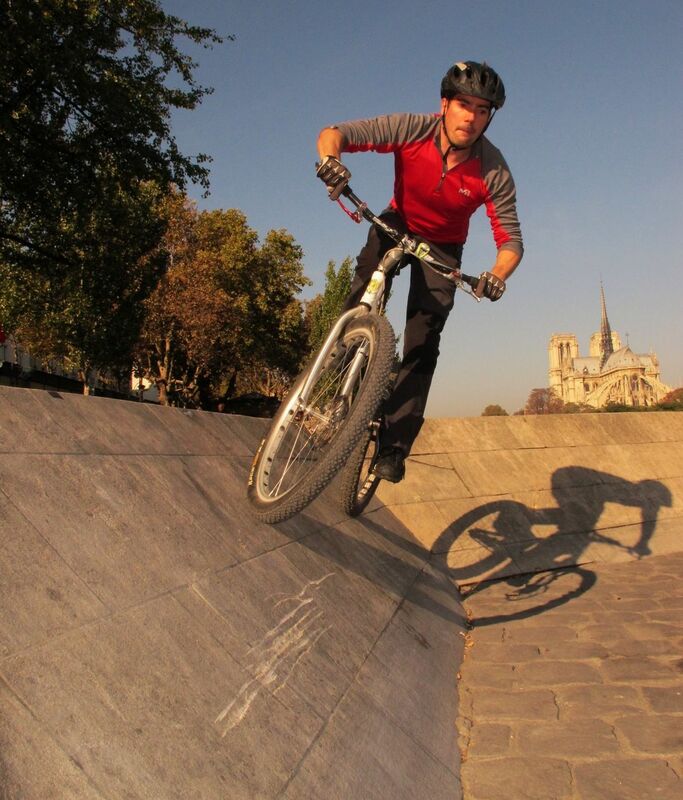 TrashZen's webmaster Julien develops and maintains the website for others to progress in this sport (also a good way for me to sharpen my skills). 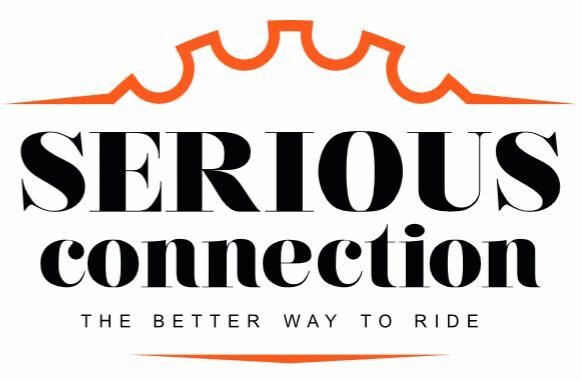 Sign-in your comments on the guestbook, all of us will appreciate. 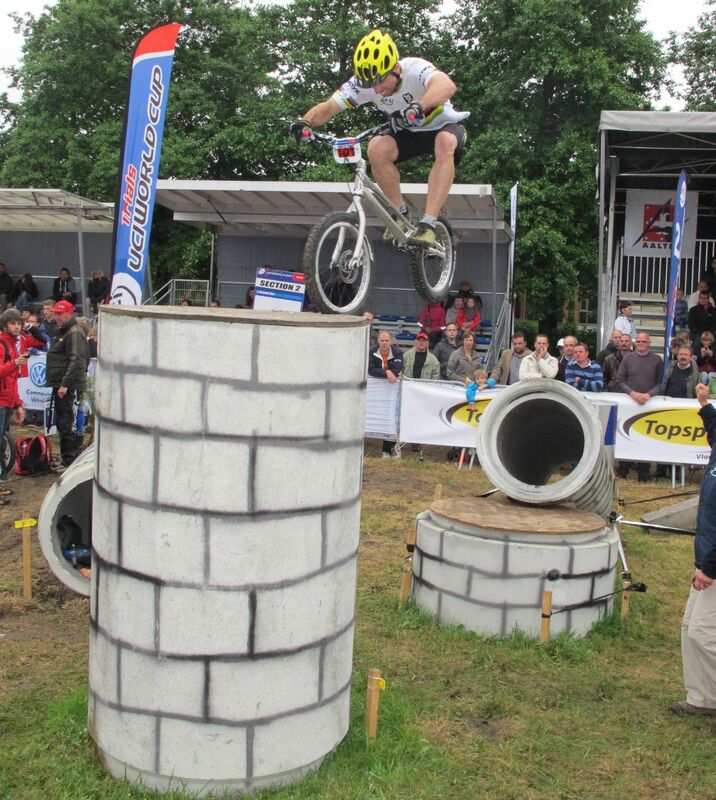 Watching pro Belgium rider and multiple world champion Kenny Belaey (a.k.a. 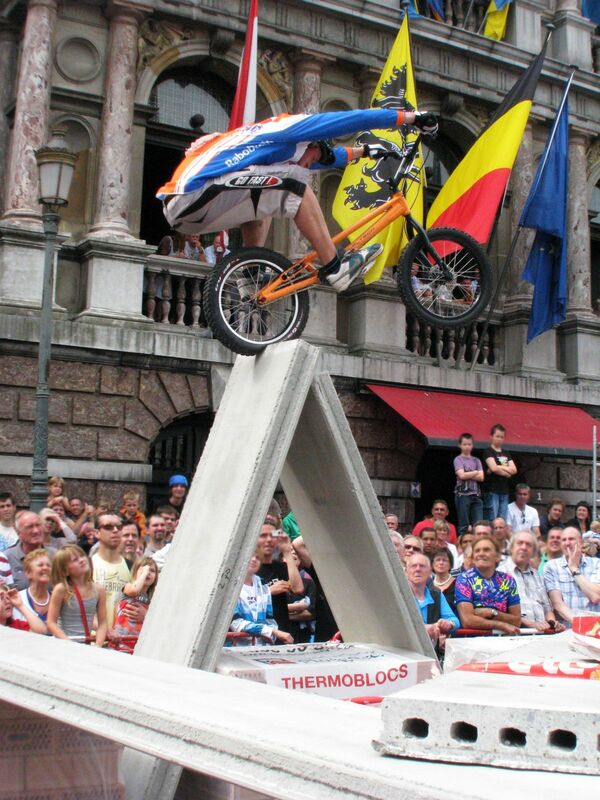 the Magician) on a bike is quite spectacular. 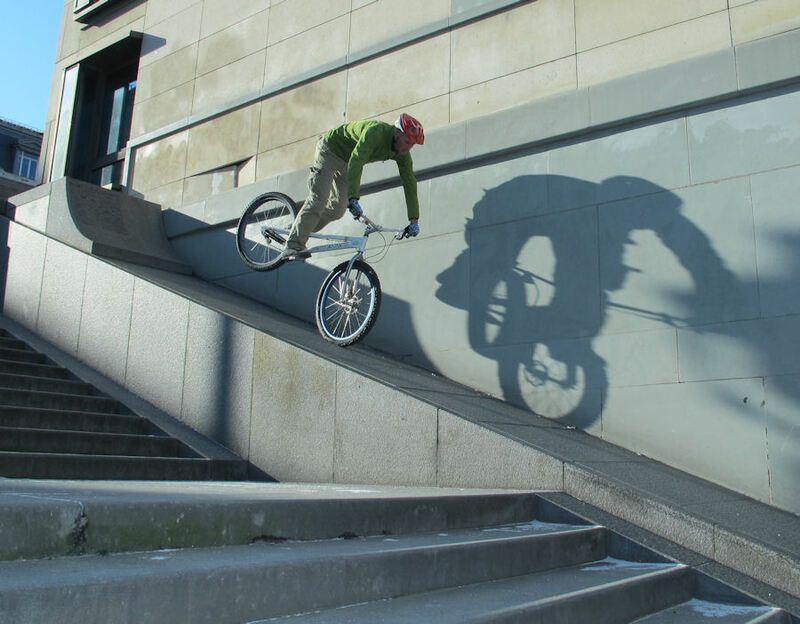 The noiseless moves and the way he makes everything look so easy is surrealistic. 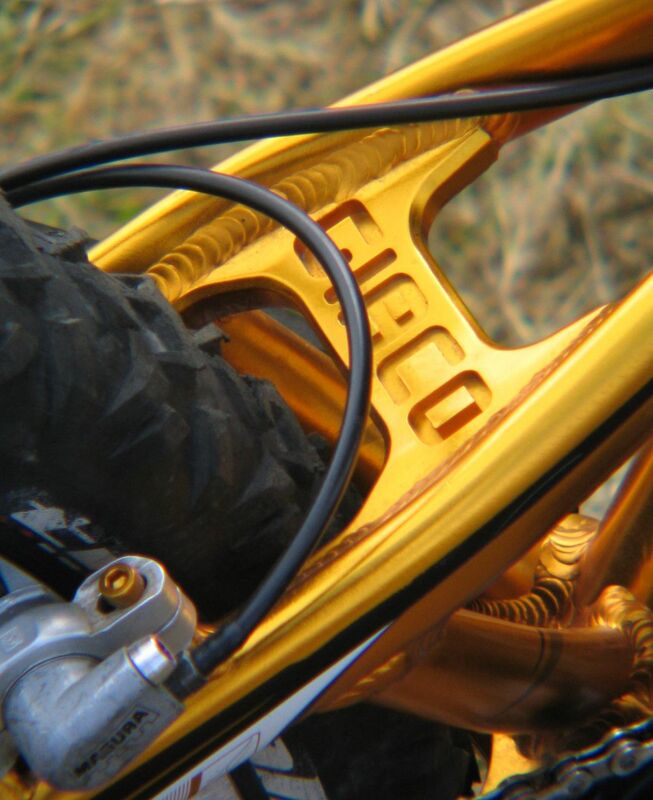 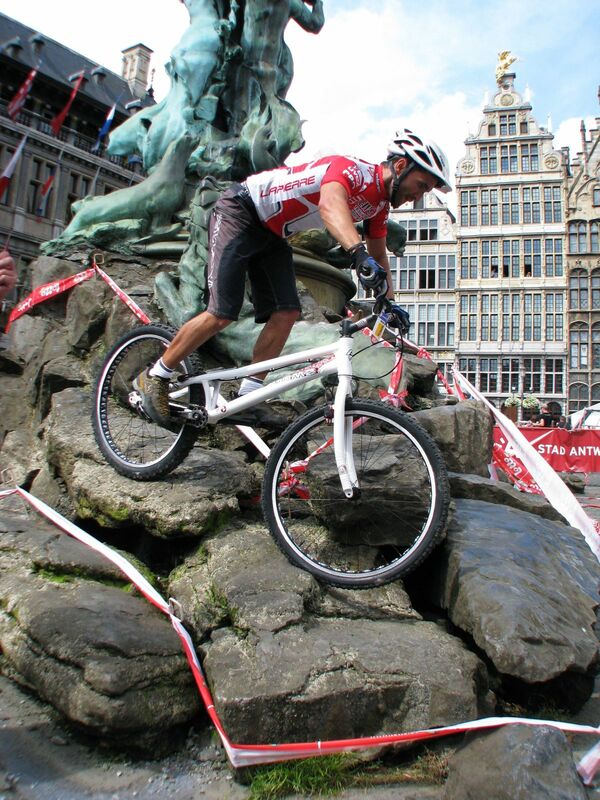 Nicolas Agyemang bought his first trials mod in early 2003. 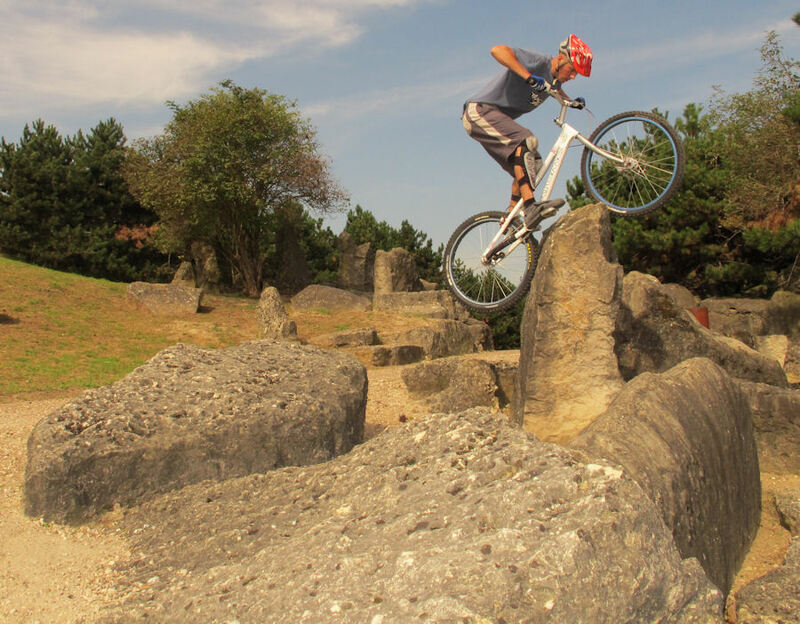 He is mostly used to urban riding, but is discovering the challenges of pure natural trials, having moved to a 26-inch trials bike a few years ago. 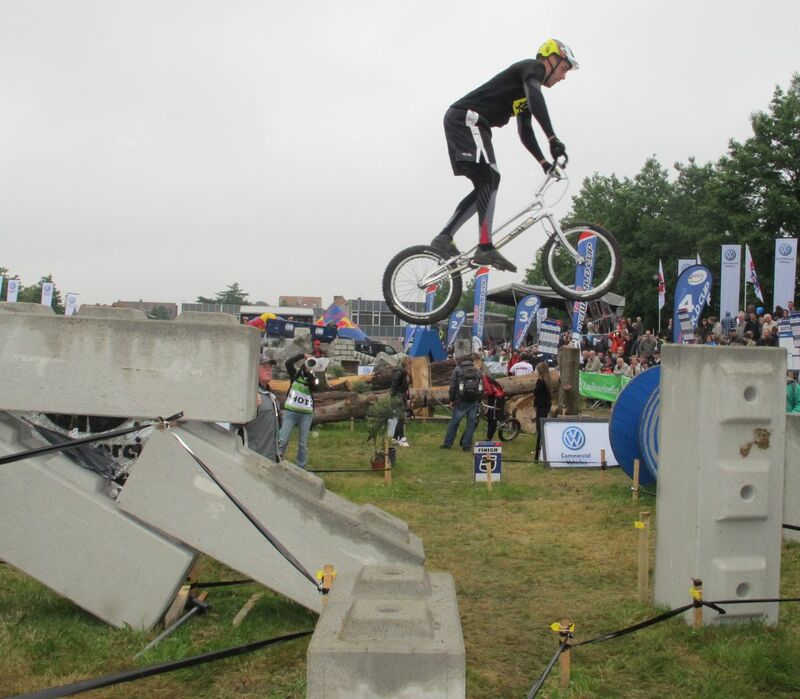 Nicolas Vuillermot forms part of the new generation of top elite French trials riders. 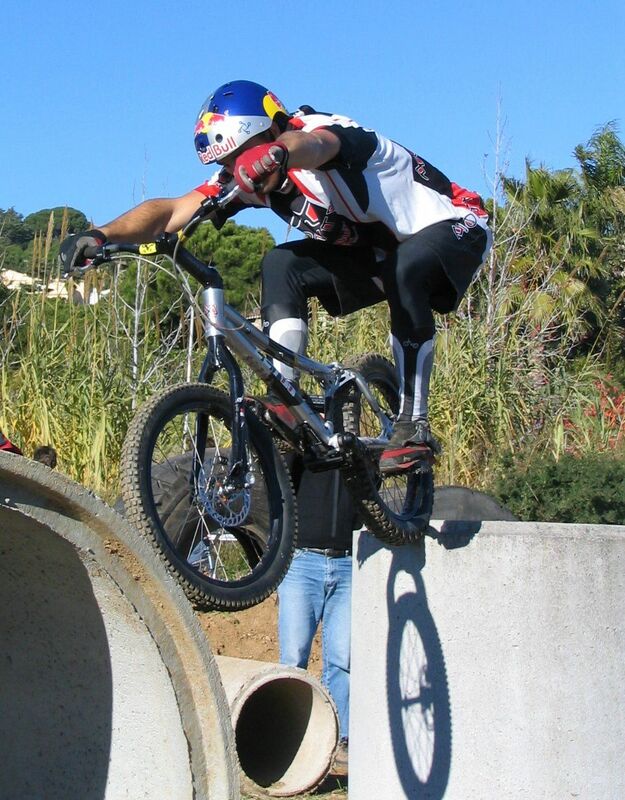 Marc Caisso (a.k.a. 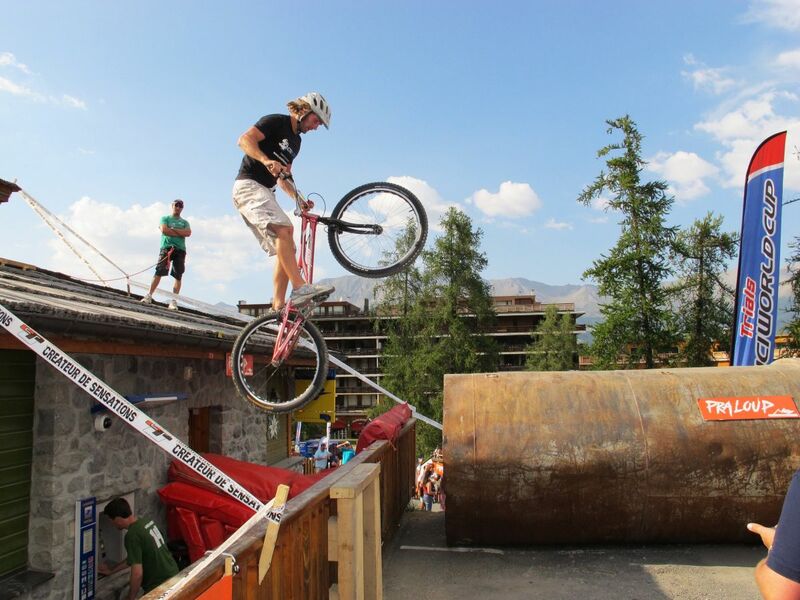 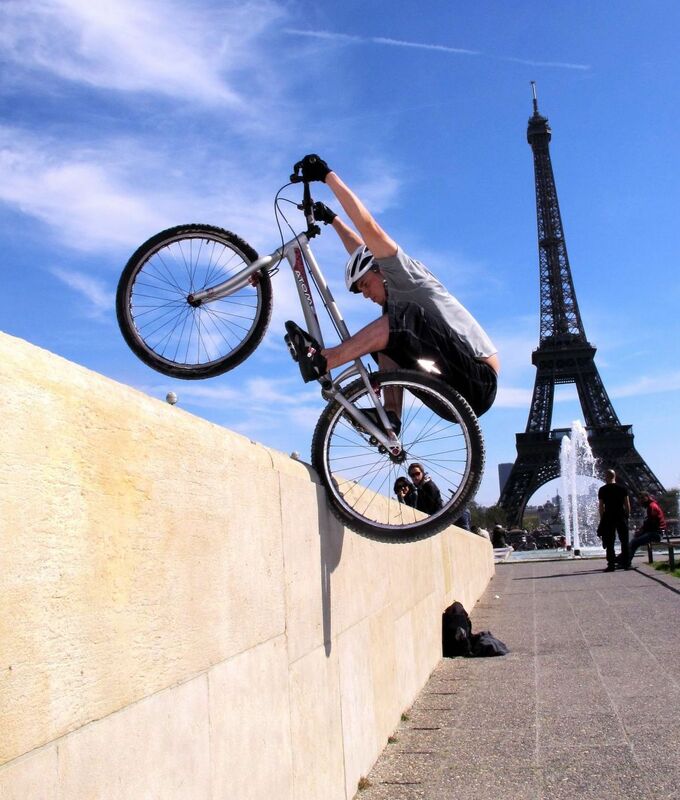 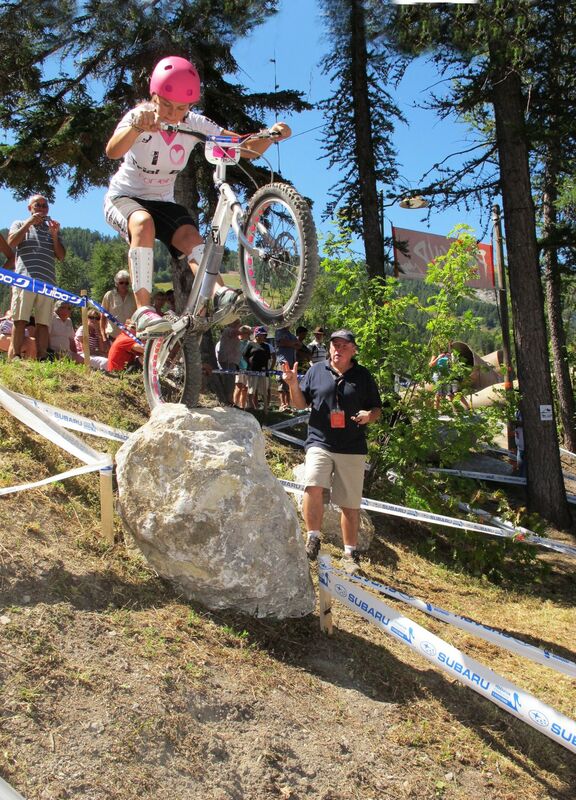 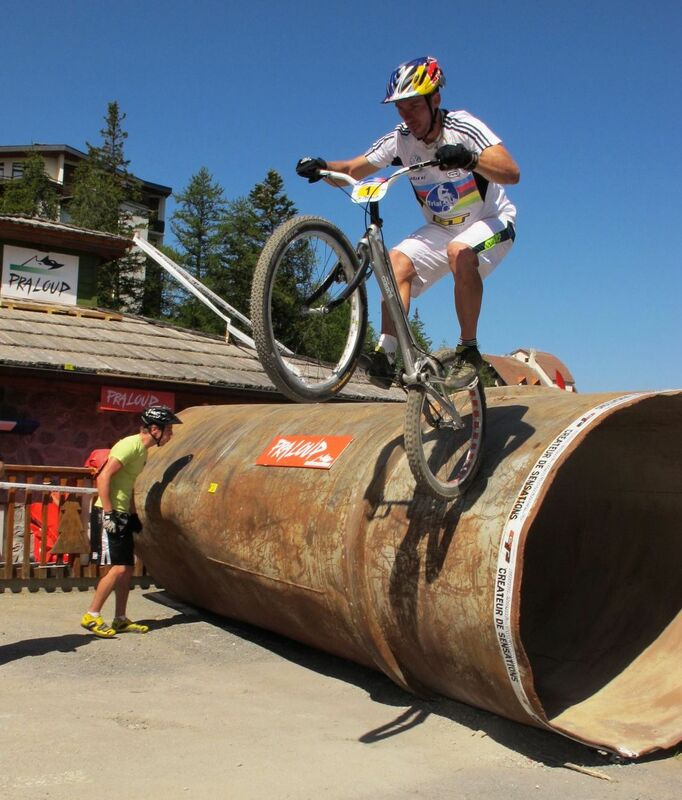 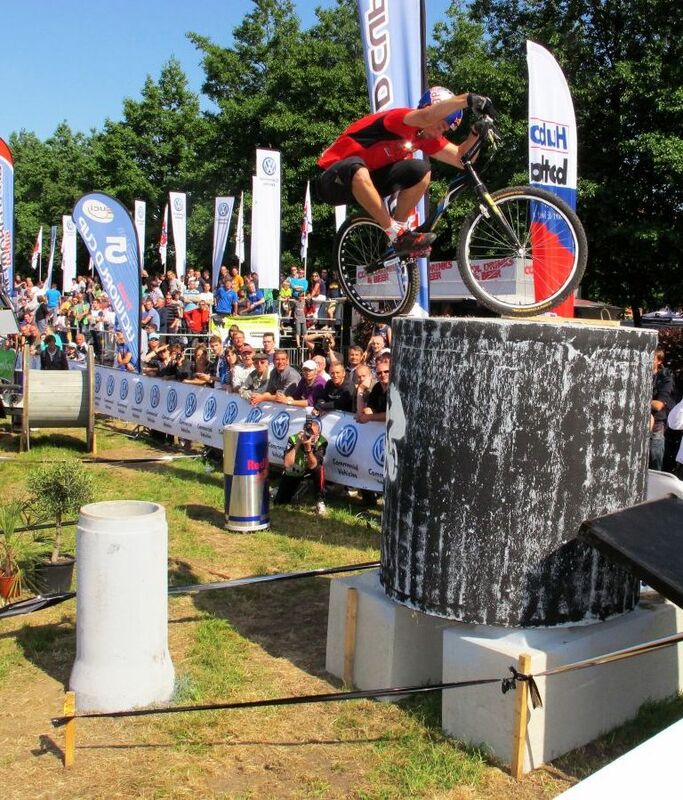 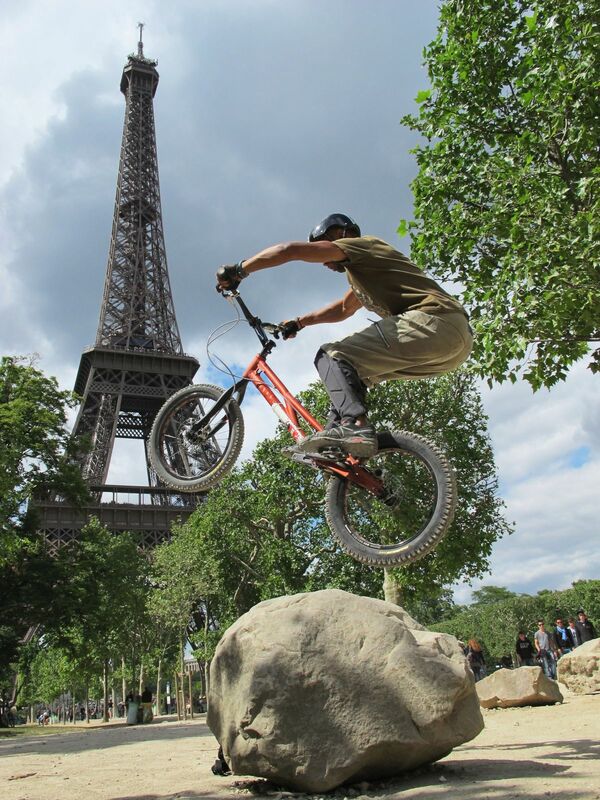 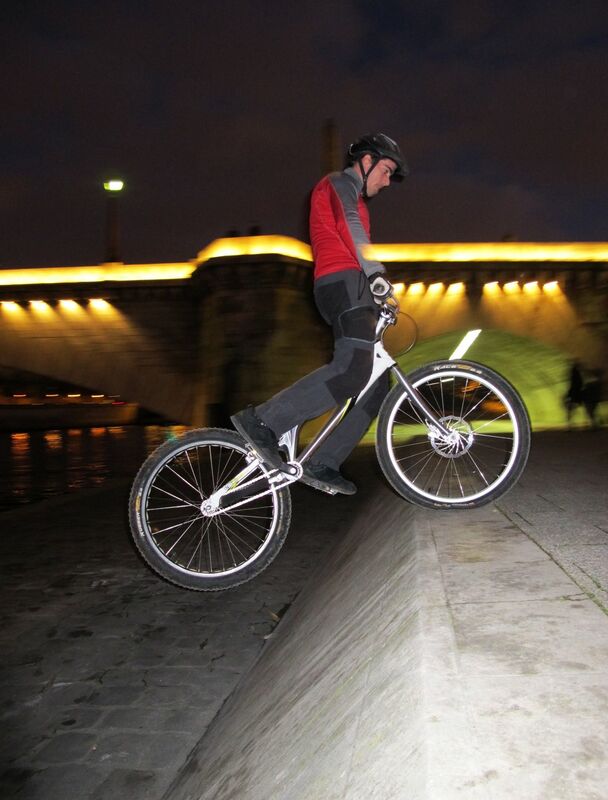 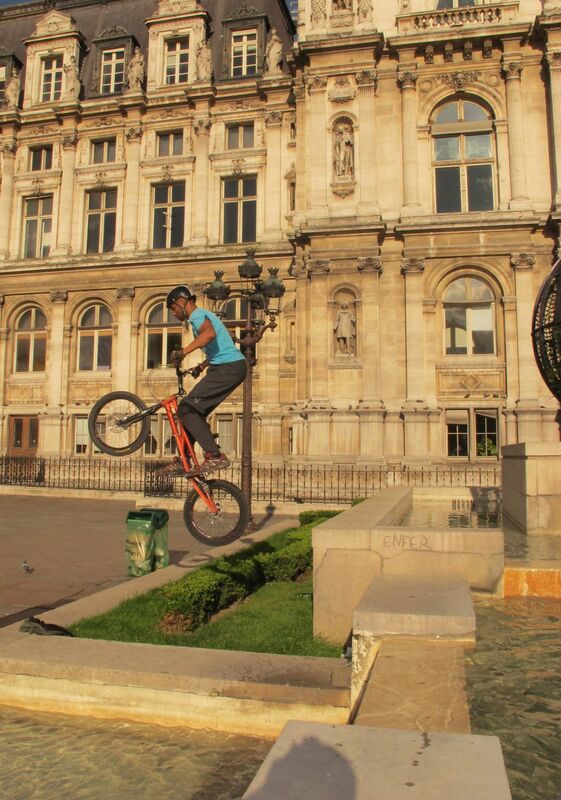 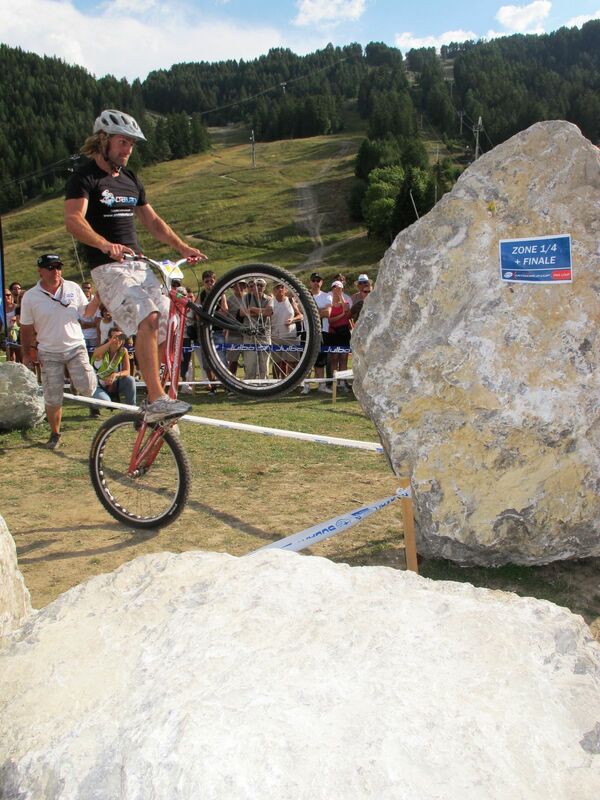 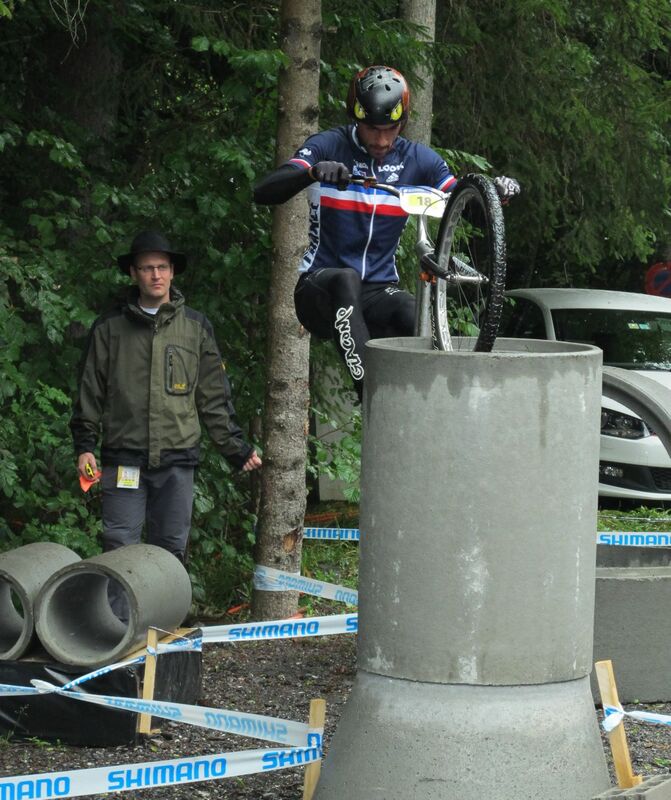 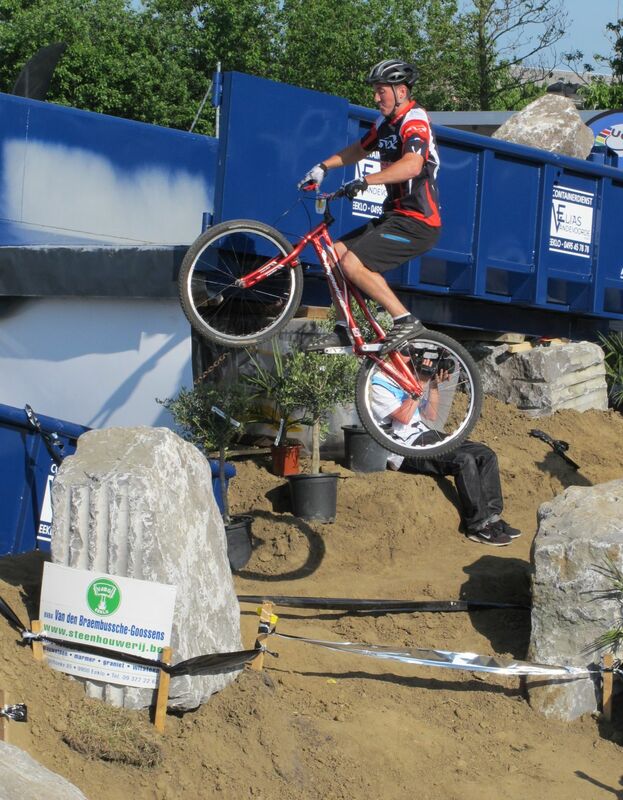 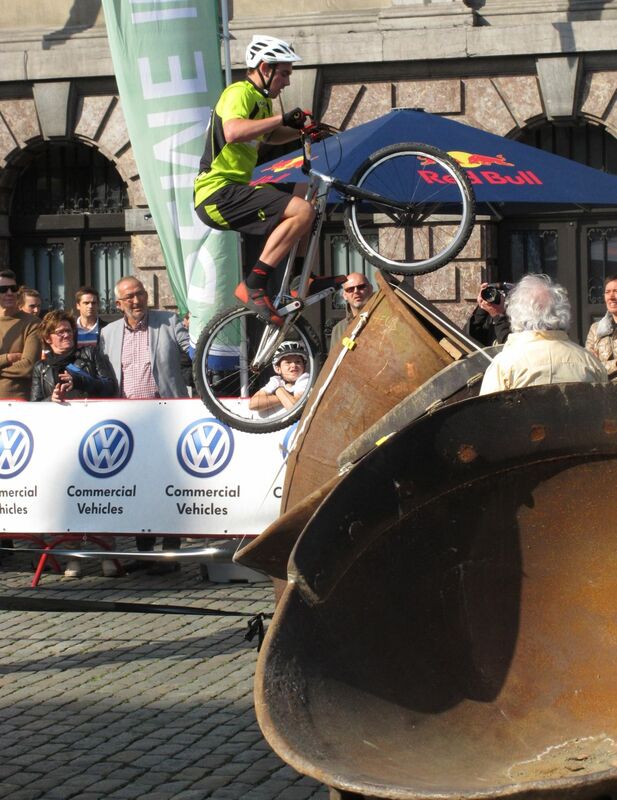 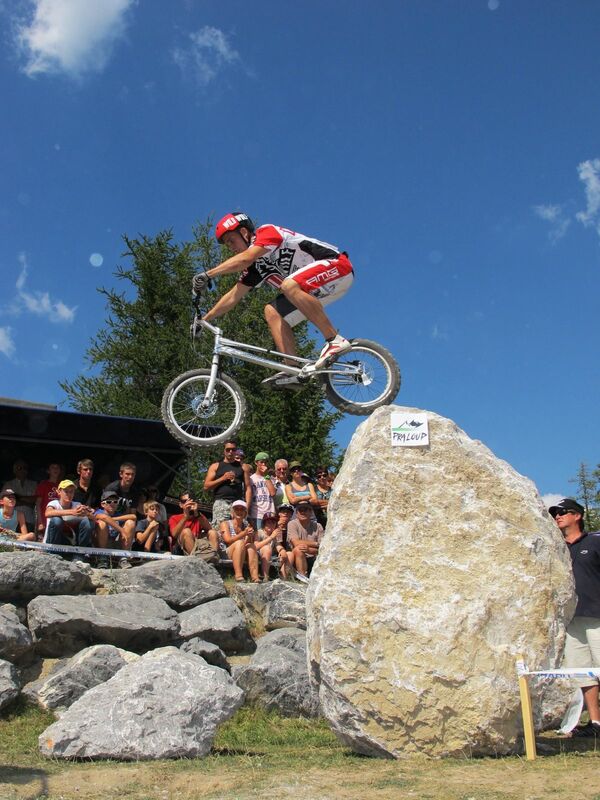 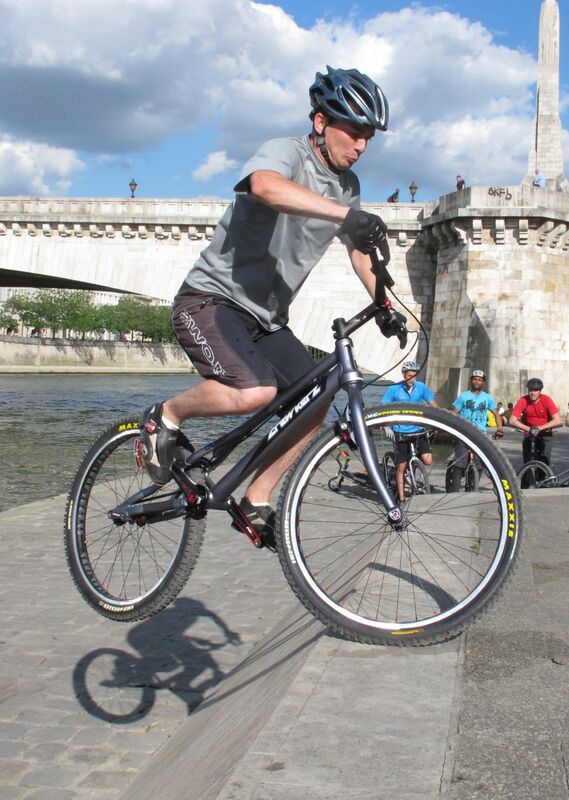 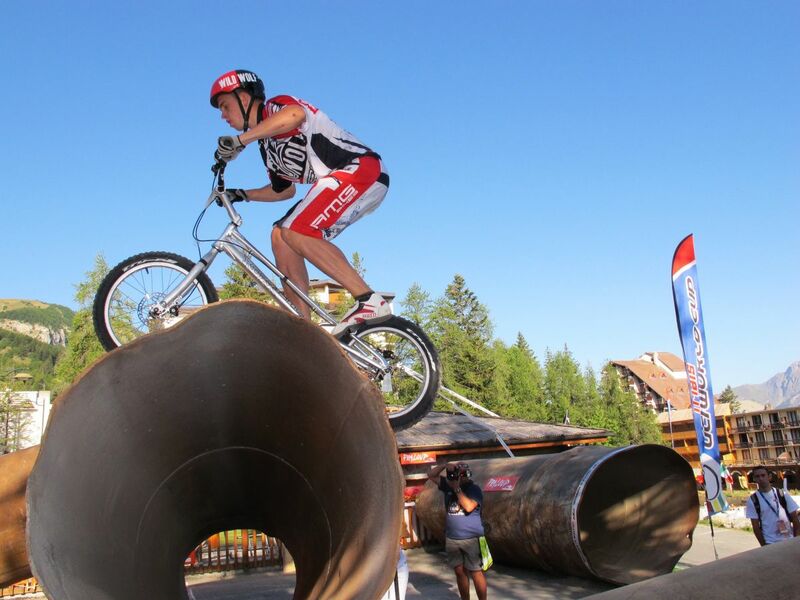 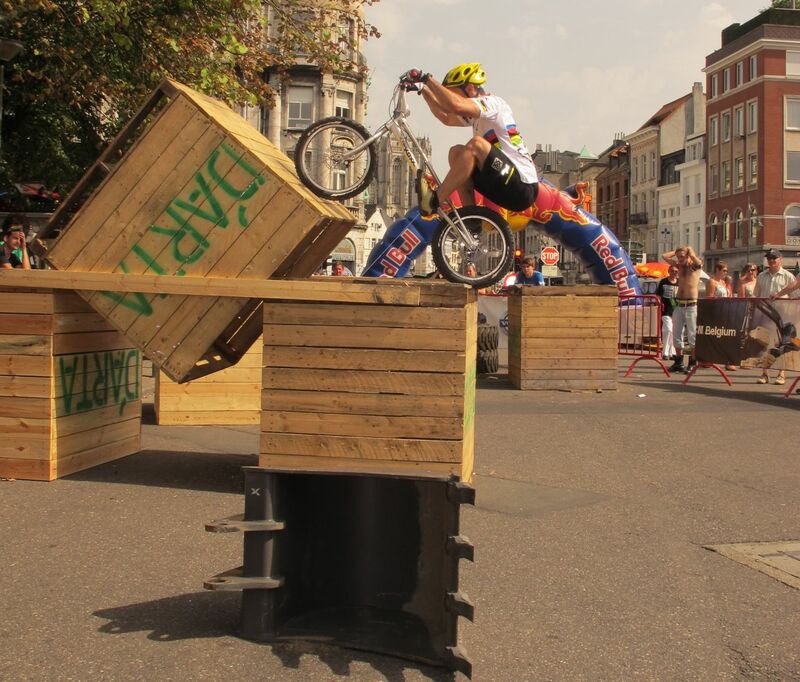 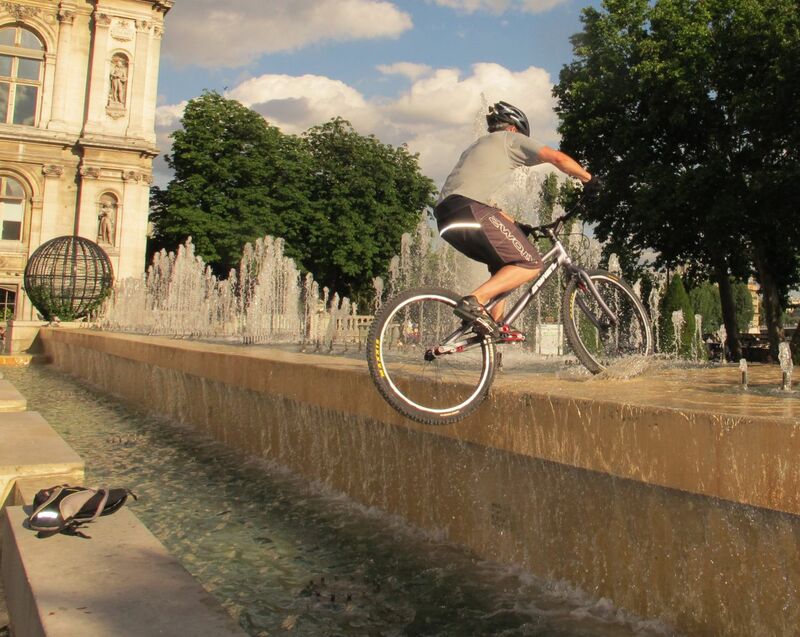 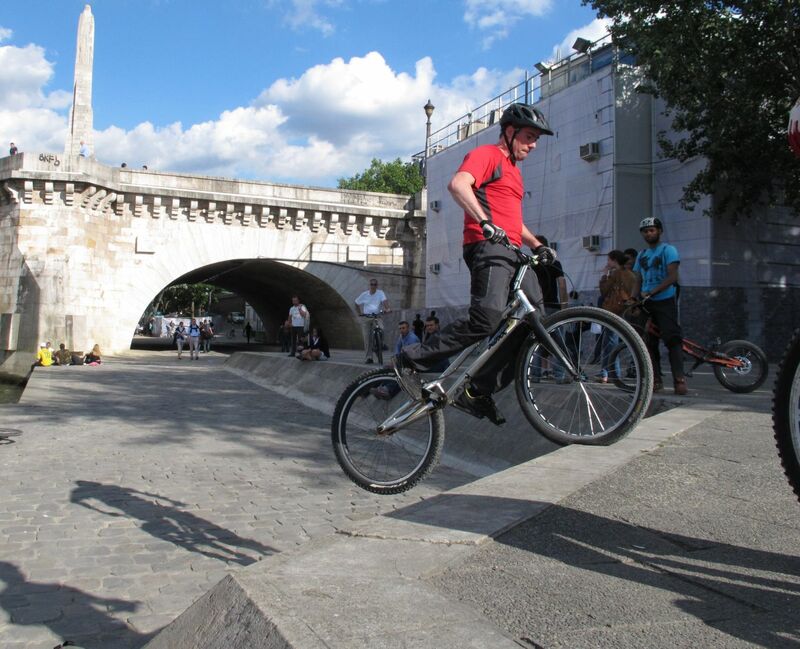 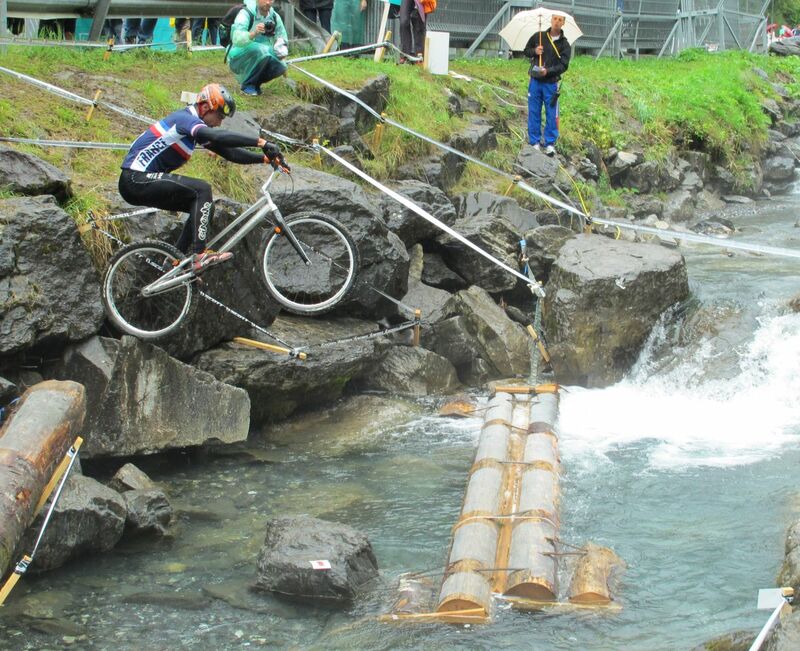 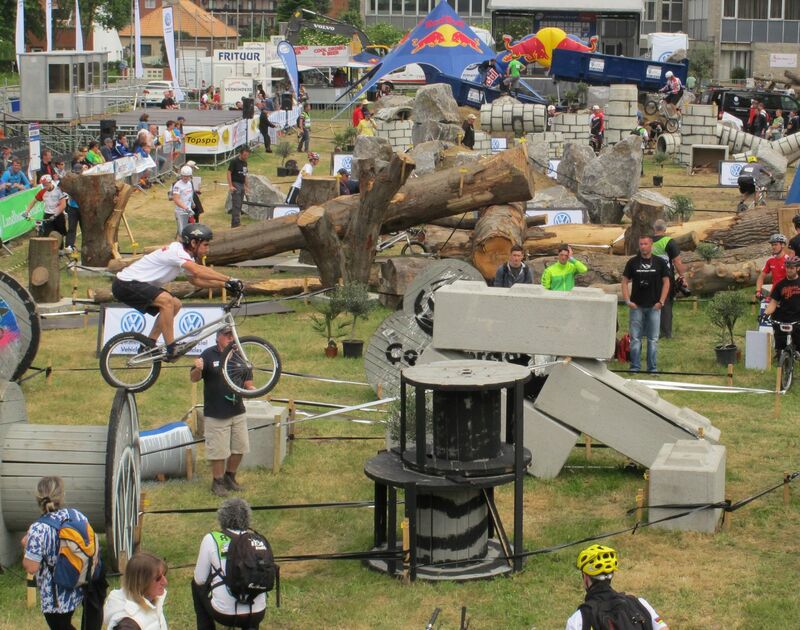 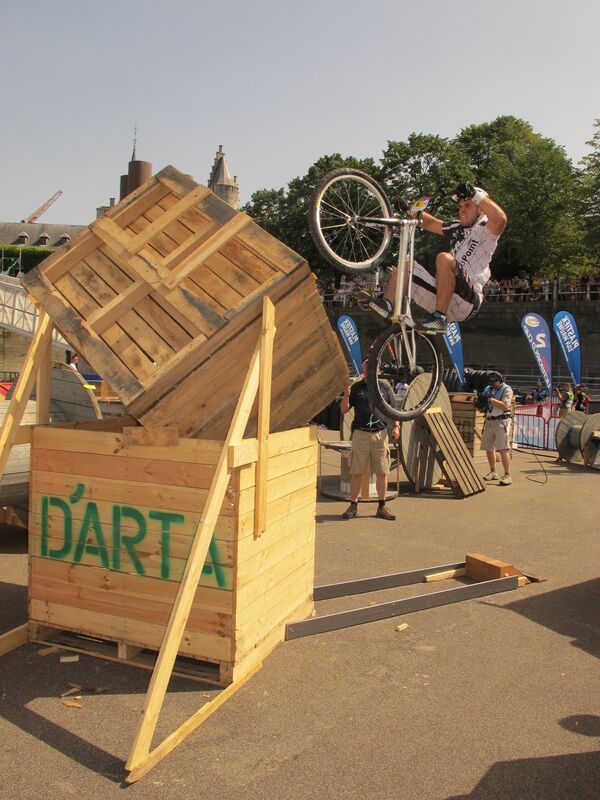 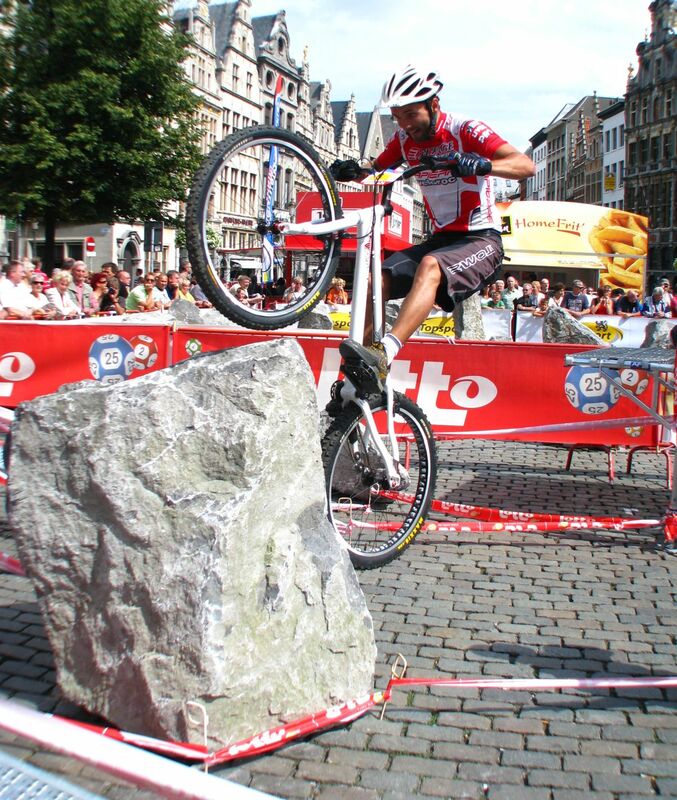 the Cat) is a French legend in bike trials. 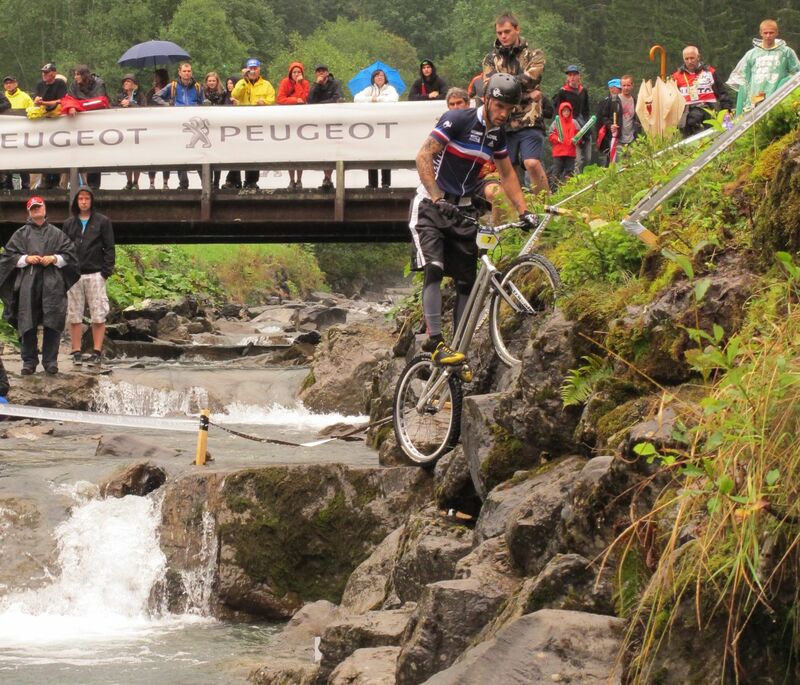 He has won several times the World Champion title, many times the vice champion title and has been countless times French champion. 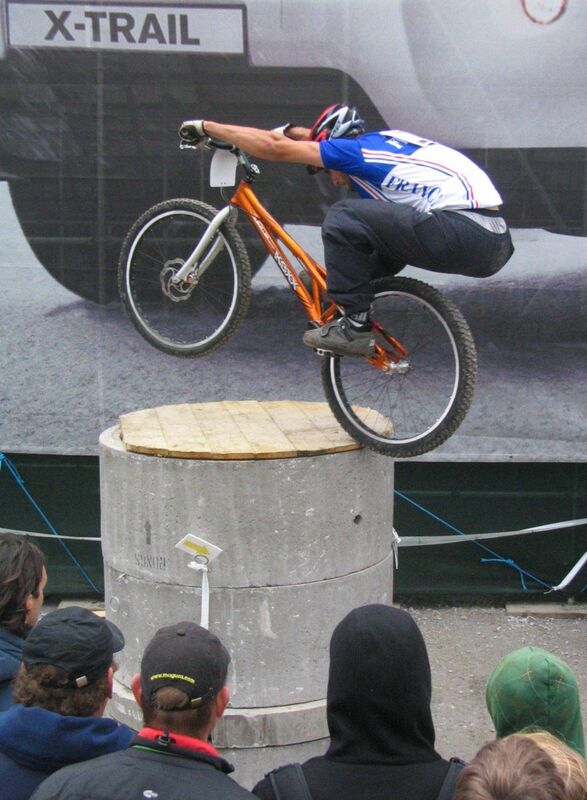 He competed on both on 20" and 26" bikes. 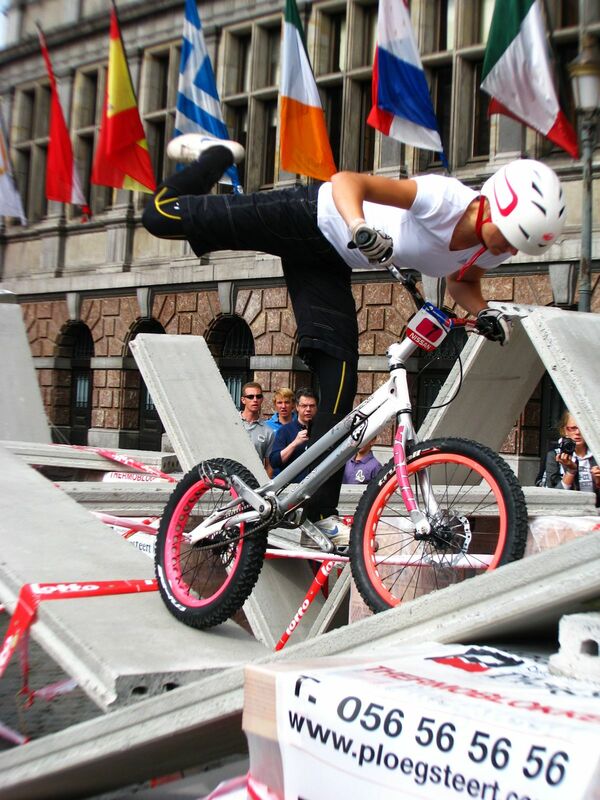 Belgium rider Perrine Devahive is a colourful character and one of the top ten female riders on the UCI bike trials circuit. 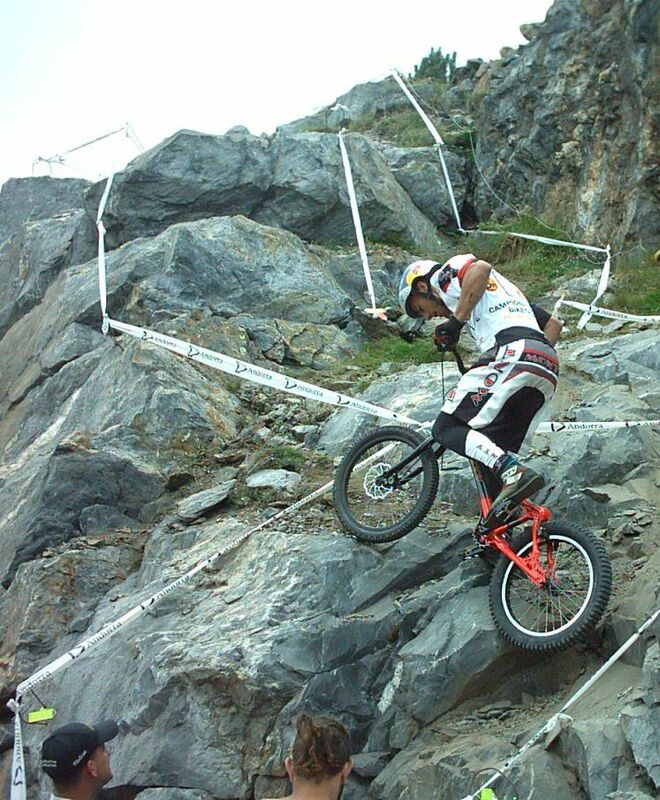 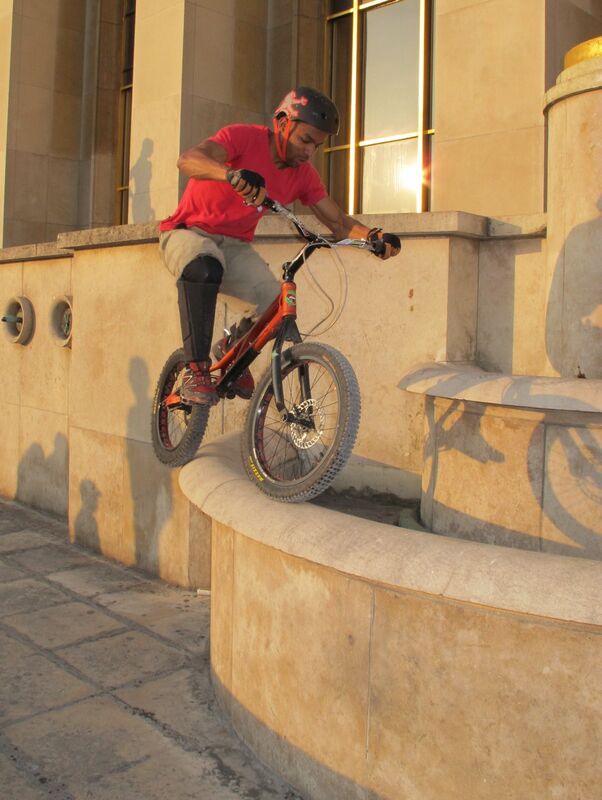 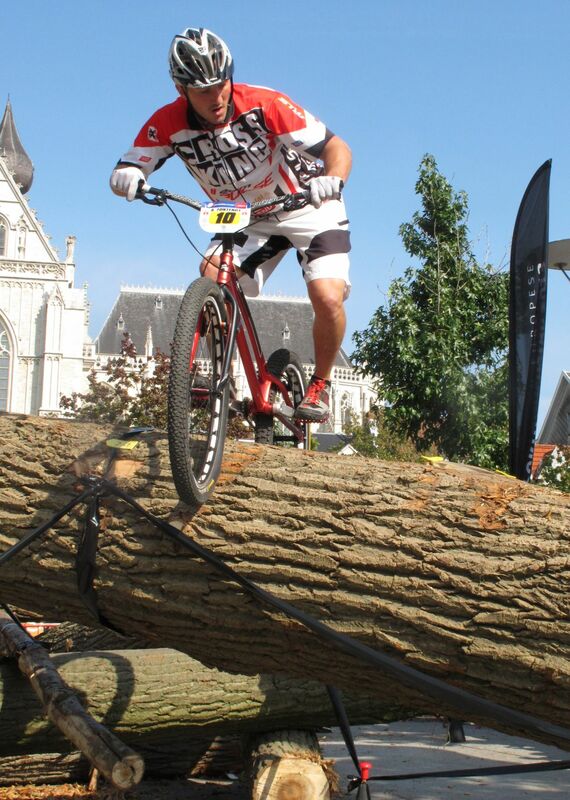 Long time friend Ramiro Aramburu has represented Argentina at UCI world competitions for a number of years. 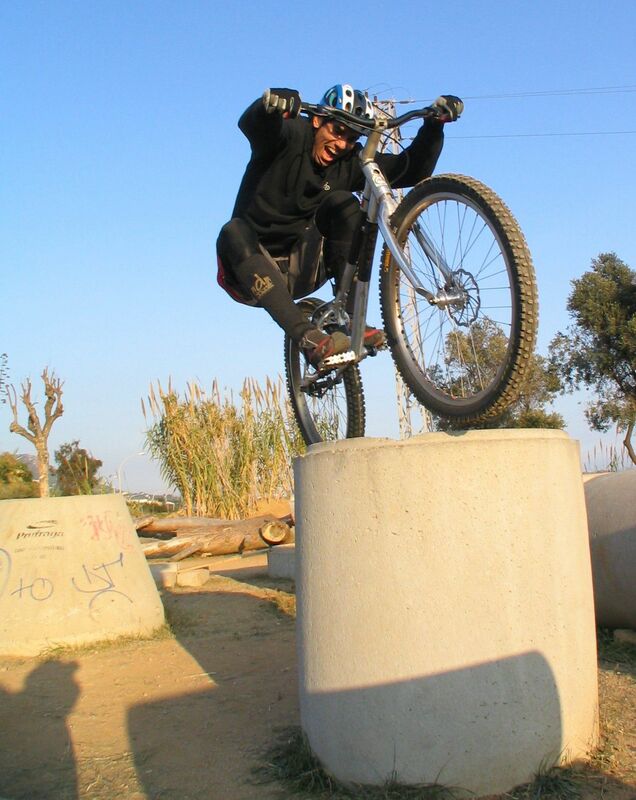 He helped me improve drastically my skills on natural terrain. 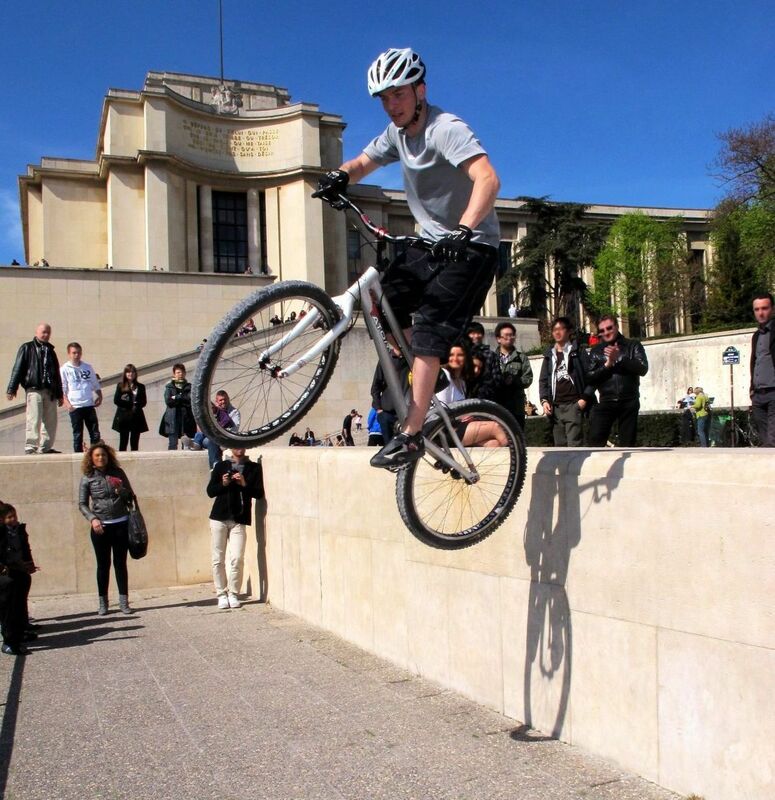 A real show-man, Rémy D. regularly impresses passers-by and tourists with his dary moves at the Trocadero and other scenic Parisian locations. 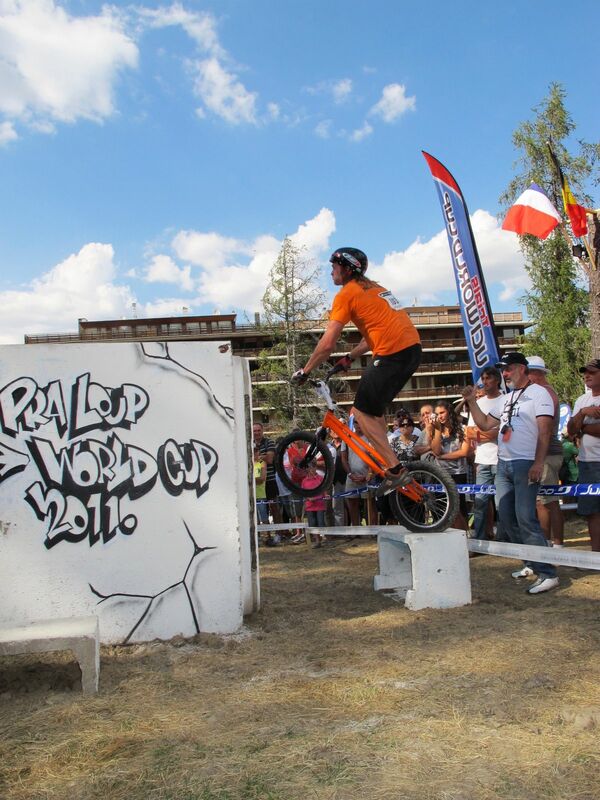 Among the most powerful mod riders around, Rick Koekoek regularly makes it to the podium at international trials competitions. 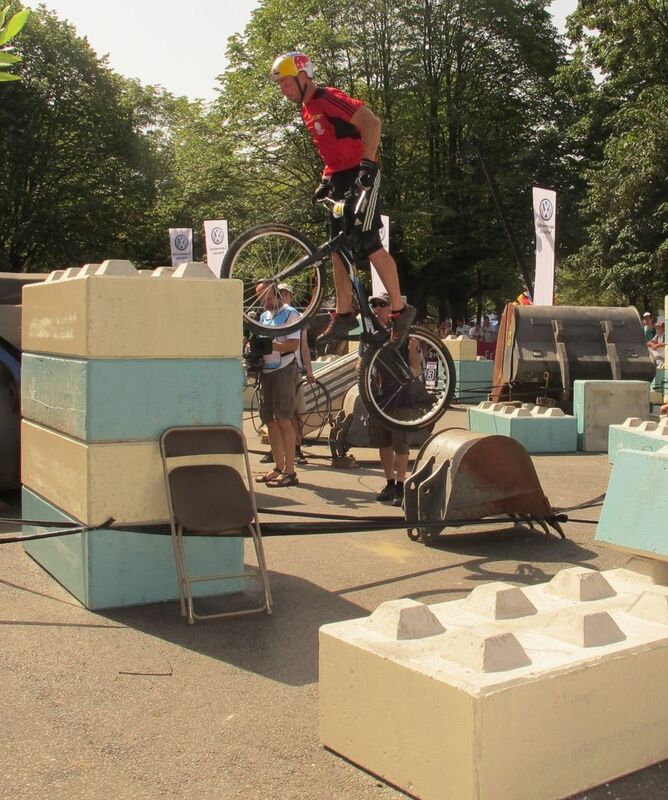 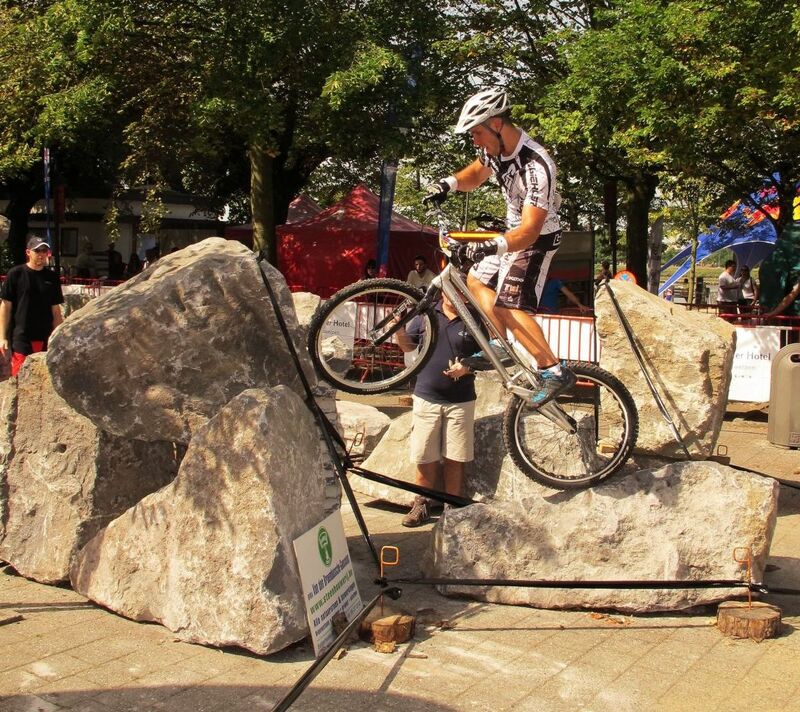 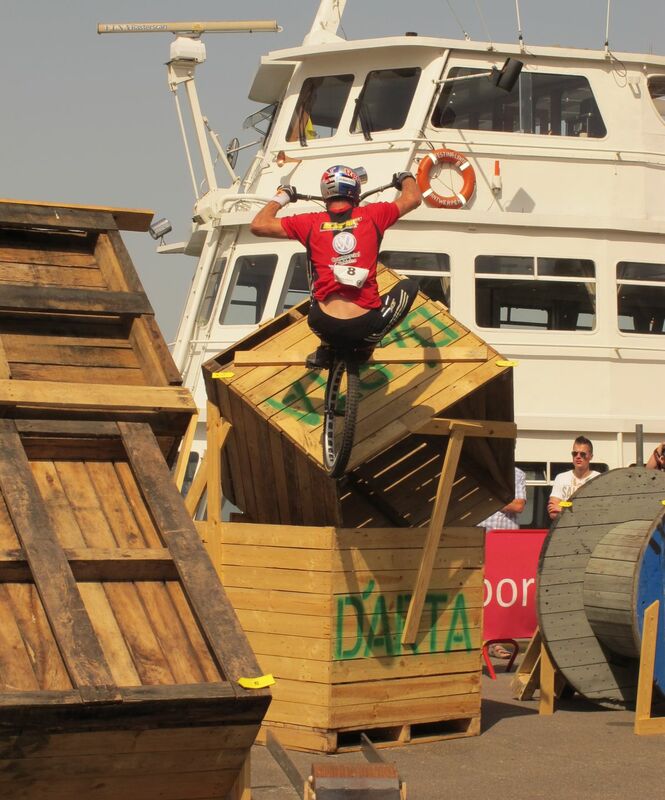 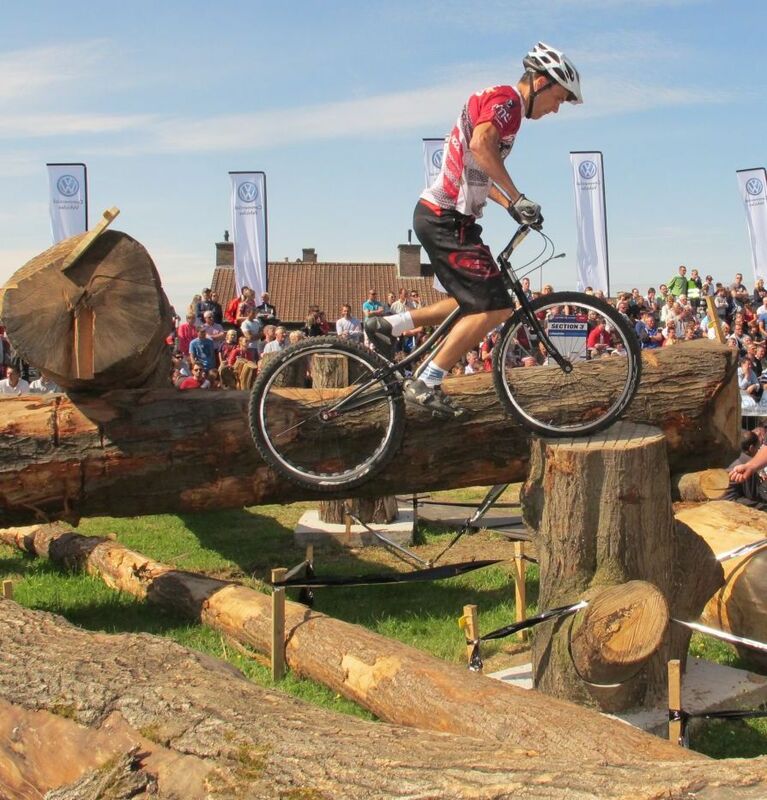 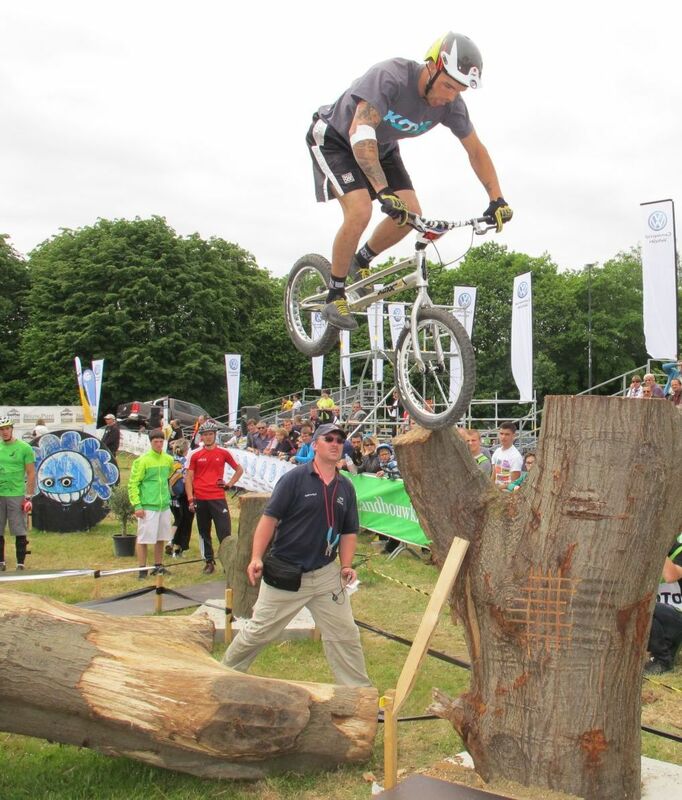 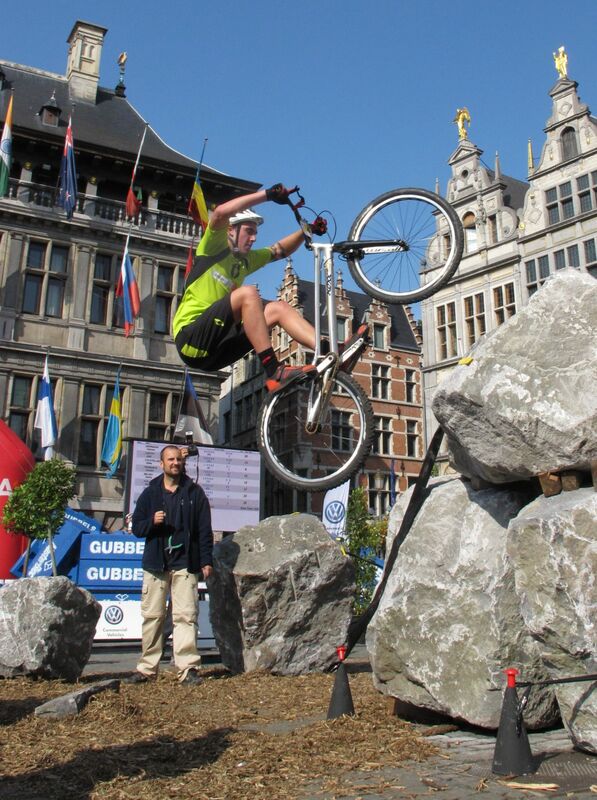 The best known rider from Canada, Ryan Leech is a star in the world of Biketrials. 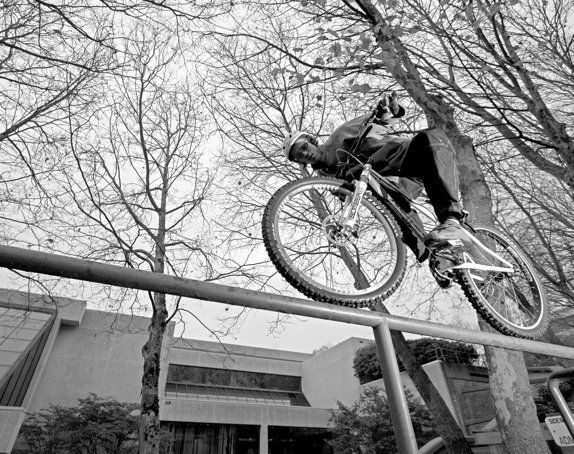 He rides numerous demos worldwide for his sponsors and has released several videos that have reached cult-Trials-movies status. 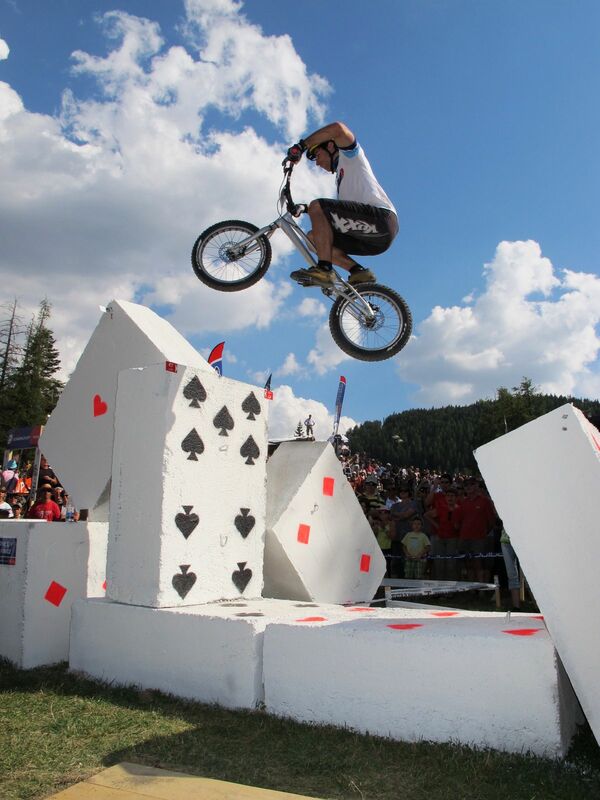 His Manifesto, Kranked and Crux videos display Ryan's amazing balance, and focus on achieving the perfect moves. 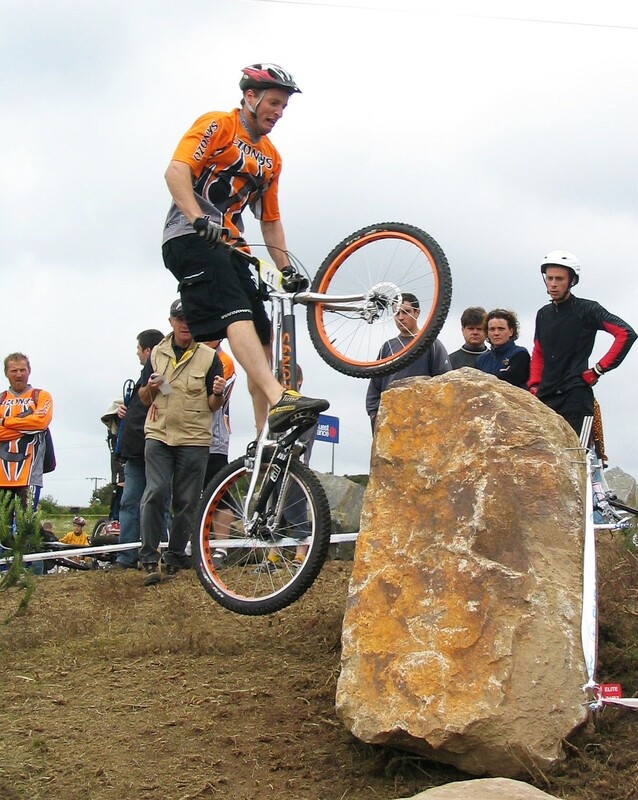 French rider Vincent Hermance has been several times world champion and holds many national titles in both the 26 and 20-inch categories. 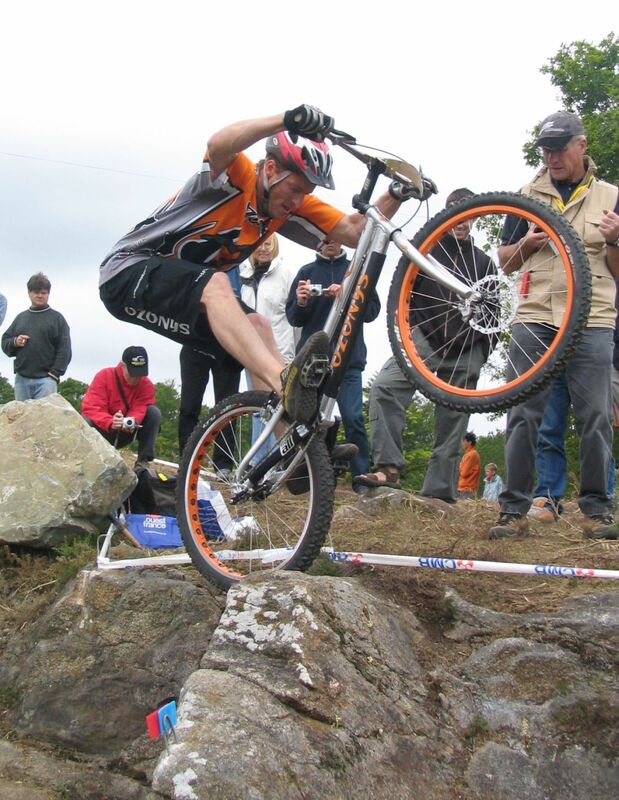 He rides for Koxx (or put it that way, the once family-owned bike manufacturer builds bikes for him to ride and win).